As teachers, we've all seen it... groups of elementary school kids crowded around a dog-eared, well worn copy of Guinness World Records. Kids are mesmerized by the pictures of the tallest man and the longest fingernails. They giggle over the flamboyant tattoos and the shocking piercings. 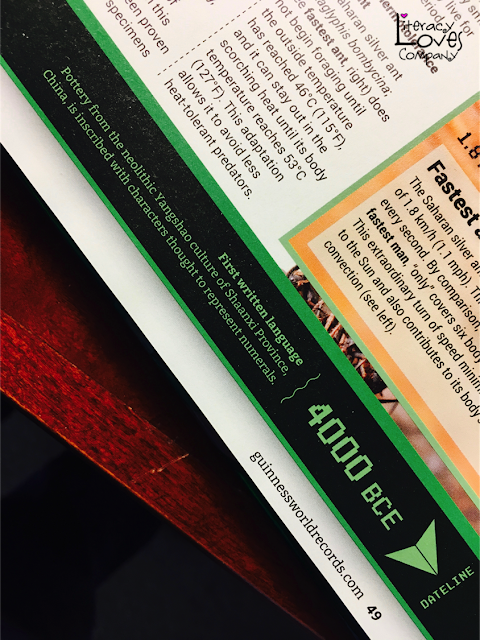 Many dream about being the fastest person, having the most home runs, or any other number of records just waiting to be broken. 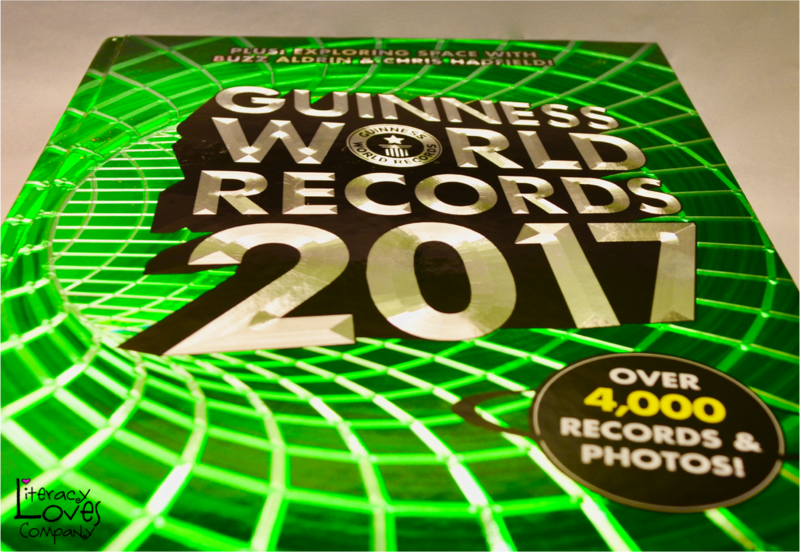 Guinness World Records is a great way to entertain students, but did you know that is is full of fascinating facts and interesting information that'll peak your class's curiosity and set them up to learn? If you've ever taken a close look at the inside of Guinness, you've seen it is ripe with possibilities. So many great ideas, in fact, that the people at Guinness have created a Teachers Guide for the new 2017 edition. You can use the Teachers Edition with a hard copy of Guinness World Records 2017 (see the end of the post for a giveaway of the book) or the guinnessworldrecords.com. 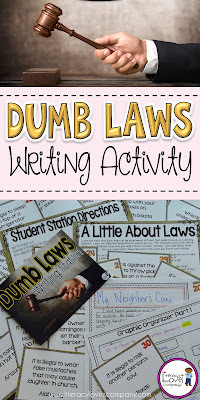 The lesson plan guide contains activity ideas for grades 2-5 and connect to the Common Core Standards. 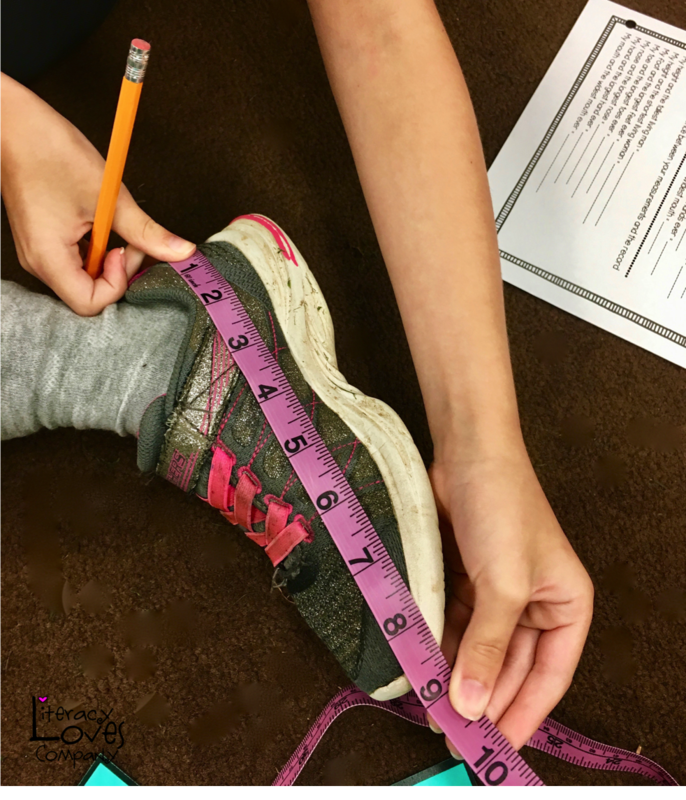 Activities include ideas for measurement and mapping, language arts, and science. In my classroom, I used the teachers guide to create a measurement math station. Students worked with a partner to measure a variety of body parts and then compared their measurements to the record holders. I've provided the sheet I used HERE as a free download for you. 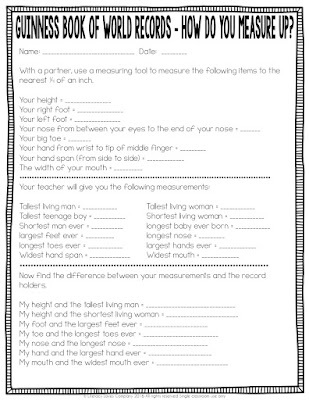 The measurements for the middle section can be found in the Teacher's Edition. I have to be honest, I always thought that Guinness was just a book full of records, but it is SO MUCH MORE! 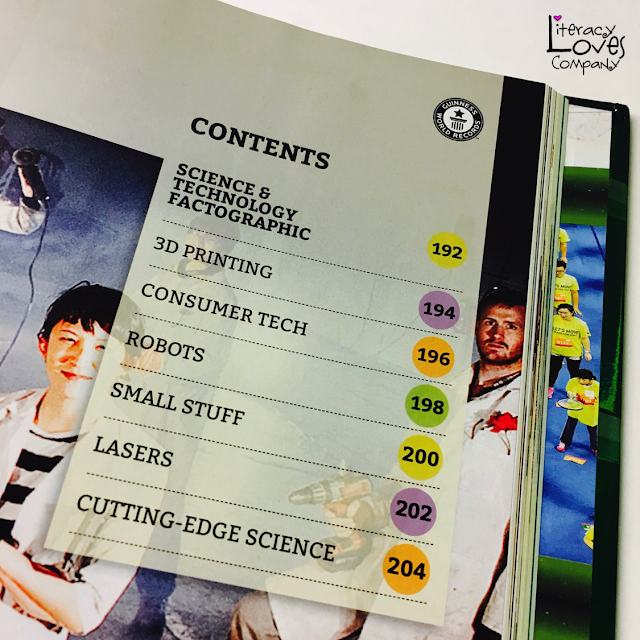 It is packed full of interesting facts and information for just about anything you can think of. As I looked through the 2017 edition I found myself continually thinking about how this book could be used to enhance just about every science and social studies unit I teach in 4th grade! I'm going to give you a quick pic-tour so you can start thinking about how you could use Guinness in your own classroom. 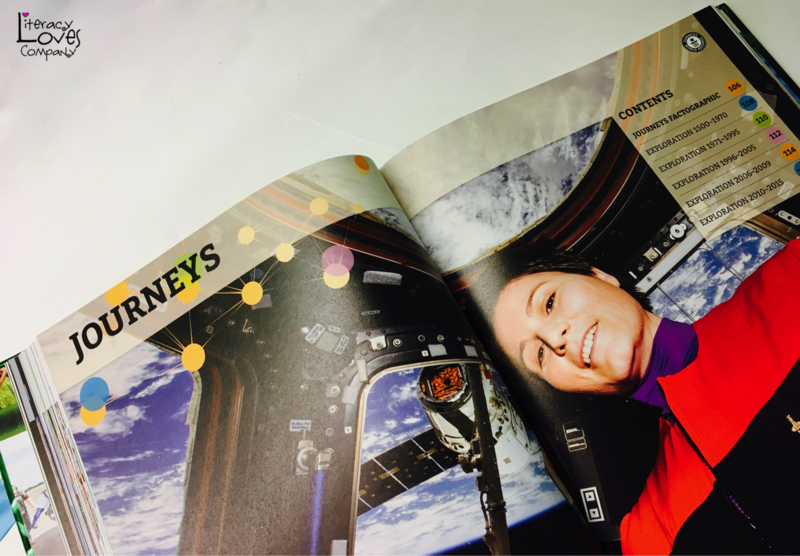 If your students learn about space as part of your curriculum, sharing some of the facts in this section would be a great way to peak interest at the beginning of your unit! 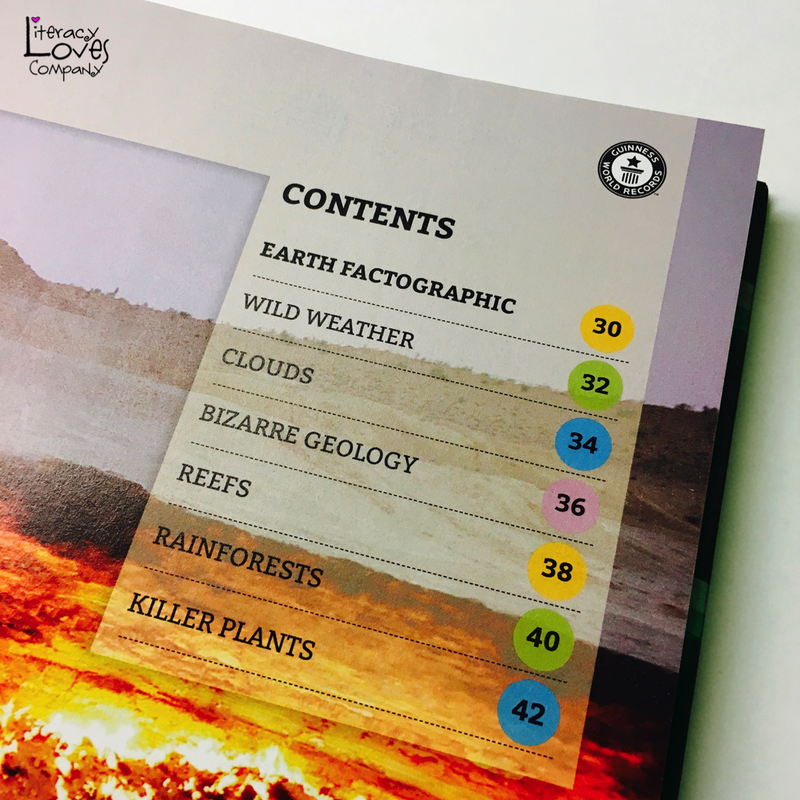 If you study geology, clouds, weather, oceans, or plant adaptations, this section if packed with fun facts students will love! Every kids loves learning about animals! 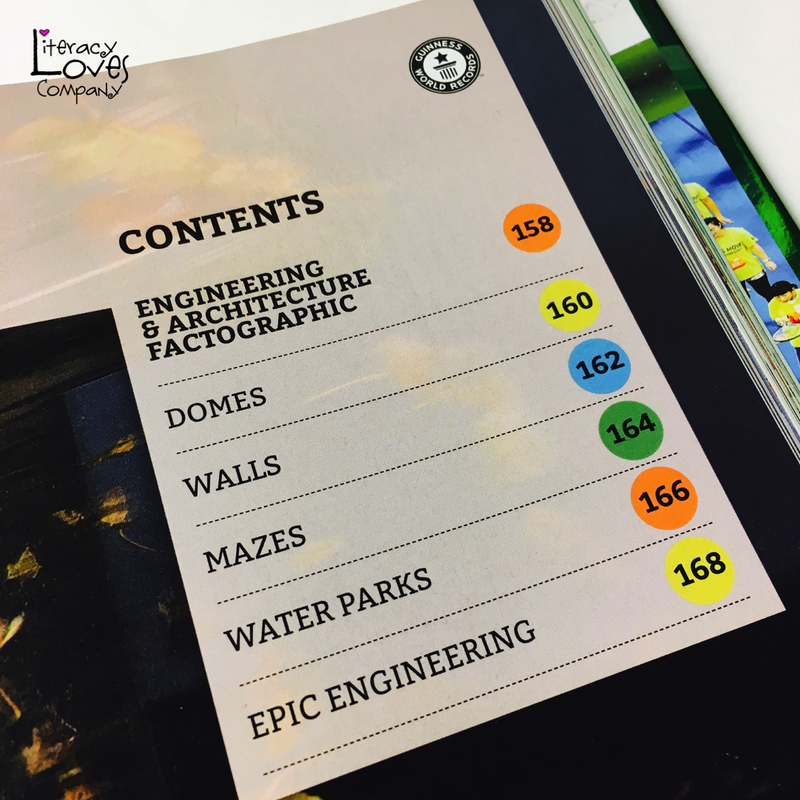 This section is full of interesting information students will get excited about. 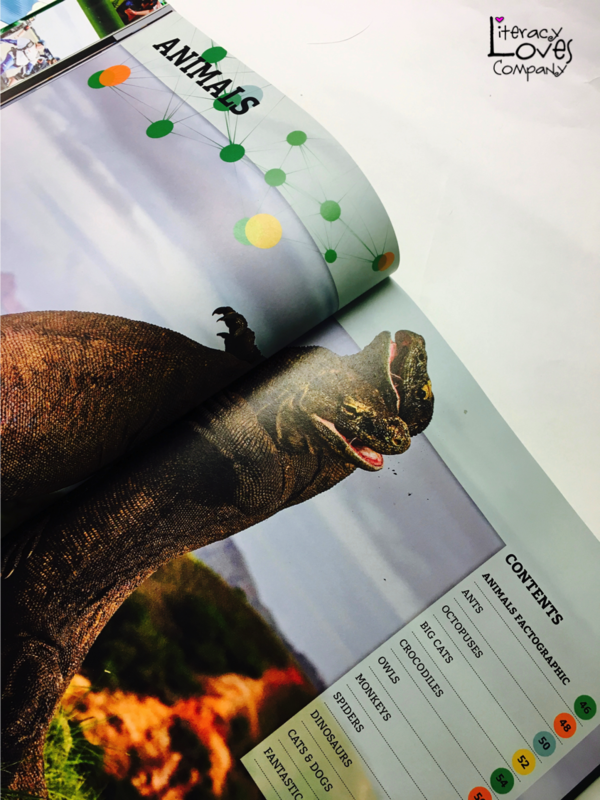 If you teach animal adaptations, habitats, spiders, or dinosaurs this is a great section to find attention-grabbing facts! 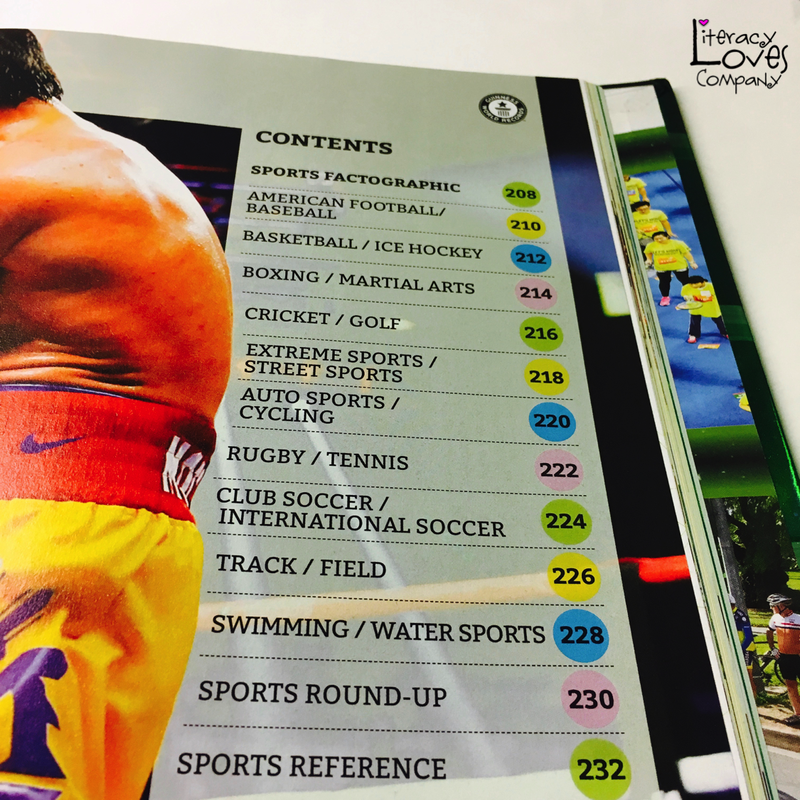 Another great feature you'll find at the bottom of many of the pages is a time line. 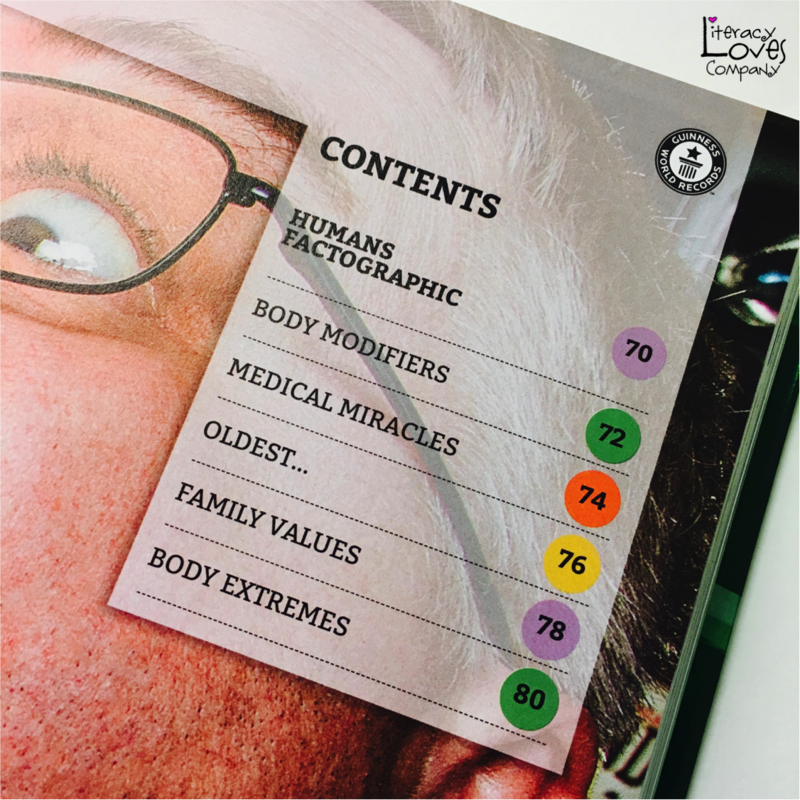 This section would be great for teachers starting a unit on body systems! 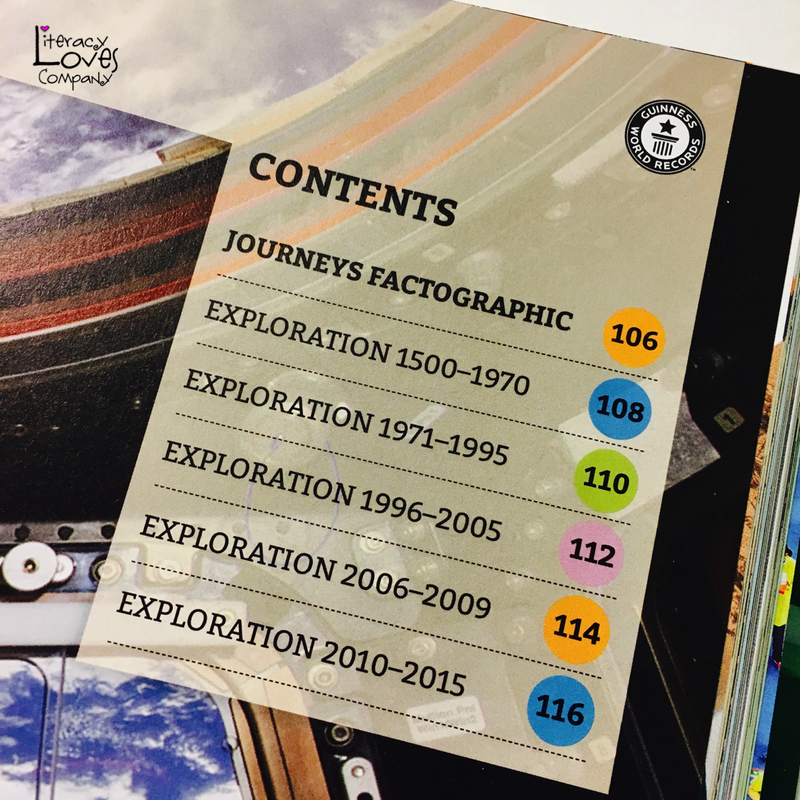 The Journey's section is a wonderful compliment to your study of explorers and explorations. 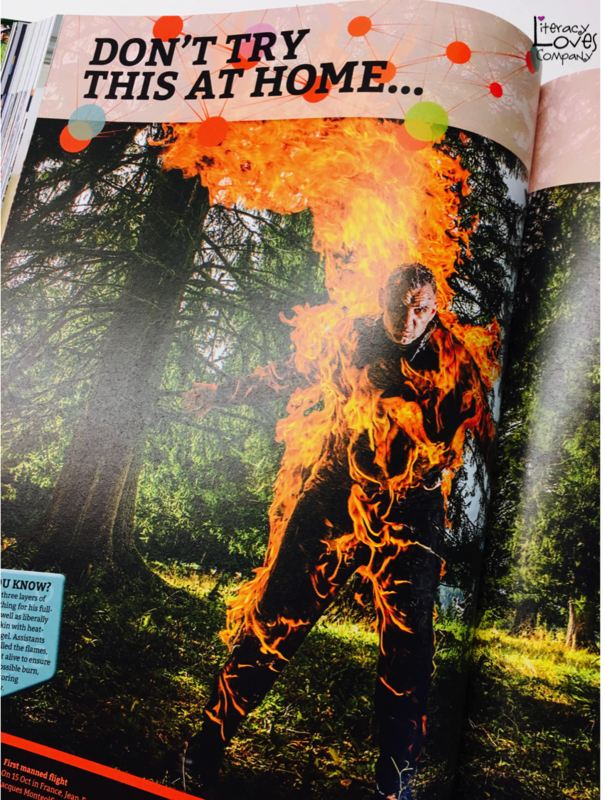 The "Do Try This at Home..." section is full of fun challenges students can try at home such as how many sugar cubes can you balance on your chin or how fast can you drink a bottle of ketchup. And some crazy things you DON'T want to try at home or anywhere else! Every kids loves toys and games! There are some great writing prompt ideas you could get from this section! 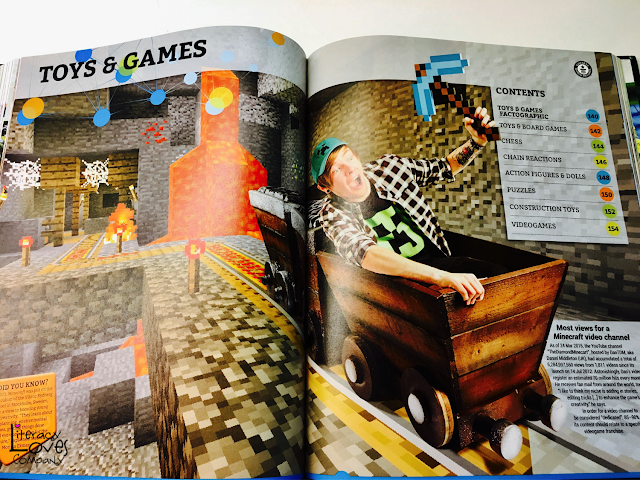 For students who love to build! The facts and information inside this section would be a great way to inspire a STEM unit! 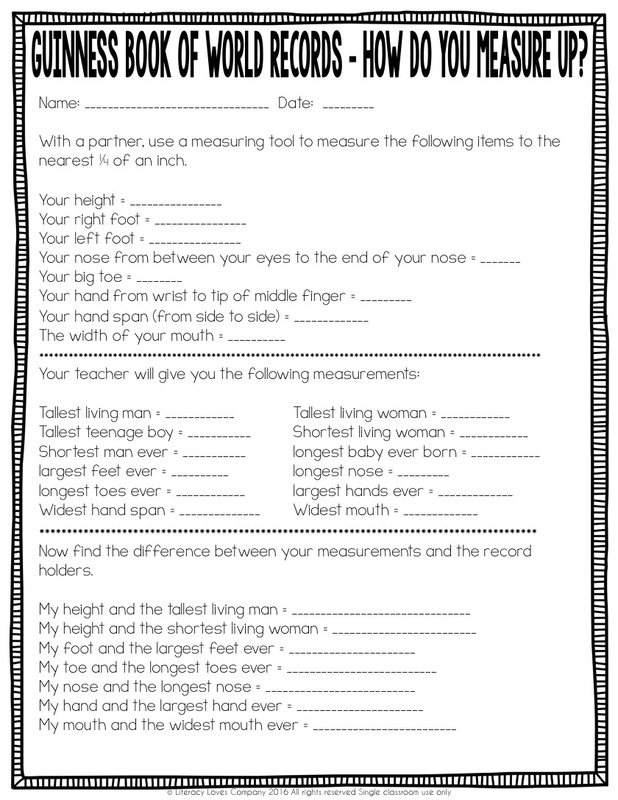 There are also a lot of measurements in this section you could use to have students compare and contrast, find the difference, etc. 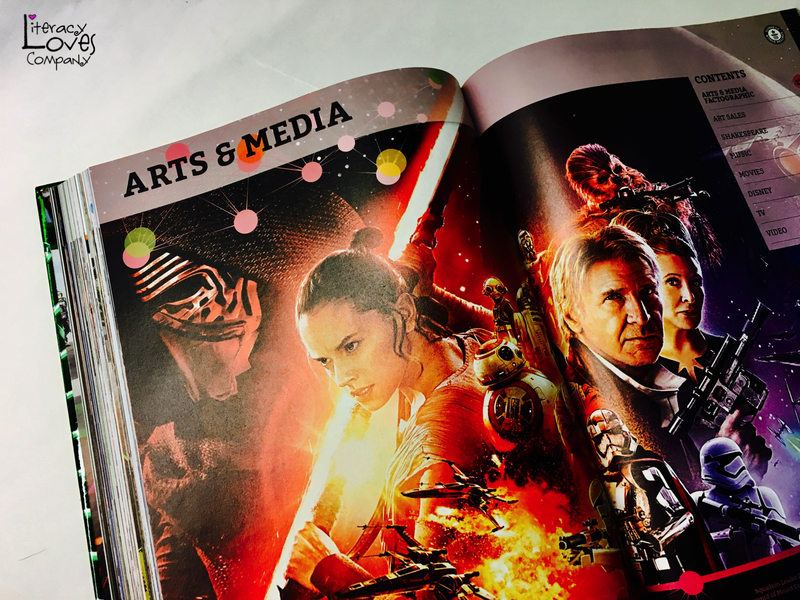 The Arts & Media section is another wonderful section to find ideas for writing. There are so many different possibilities with this section! 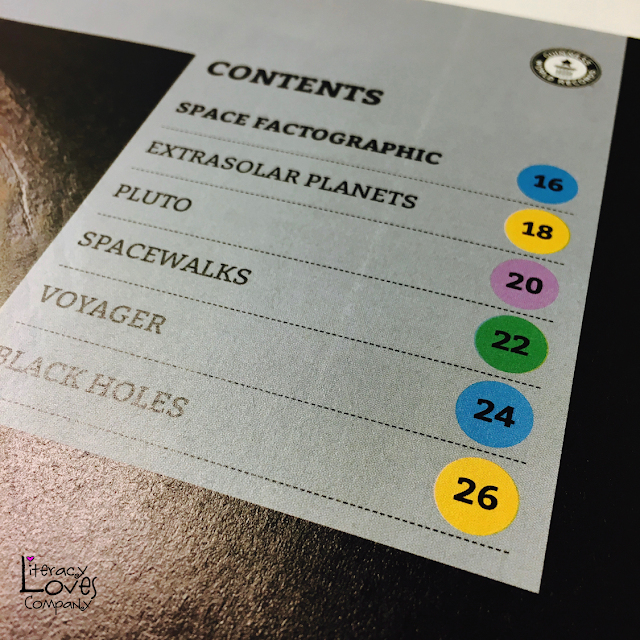 Writing prompts and facts to grab learners at the start of a science unit are just a couple. The sports section is another favorite of students! 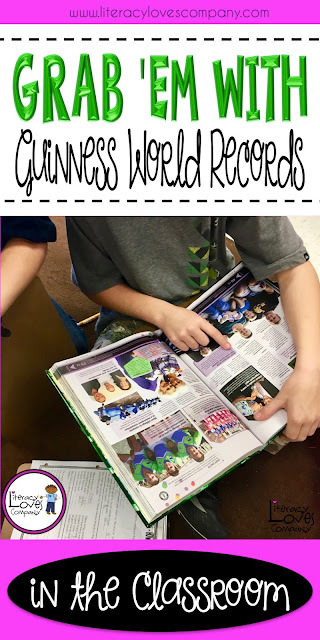 As you can see, Guinness World Records is a valuable resource for any classroom! 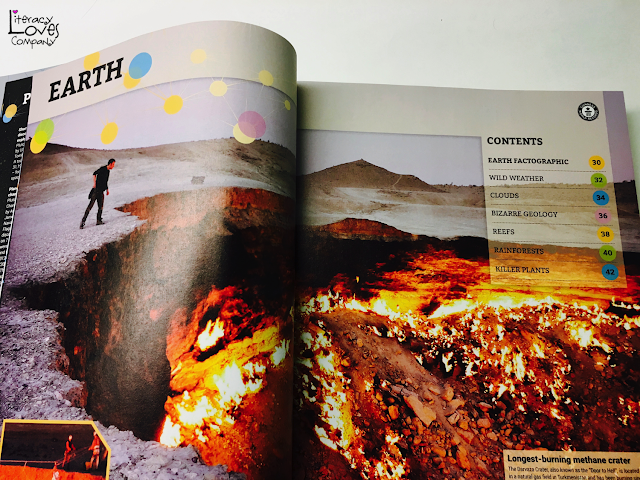 It is not only a favorite of students, but there is a lot of great attention grabbing content inside of this book for teachers to use as a support and enhancement to your grade-level lesson and units! 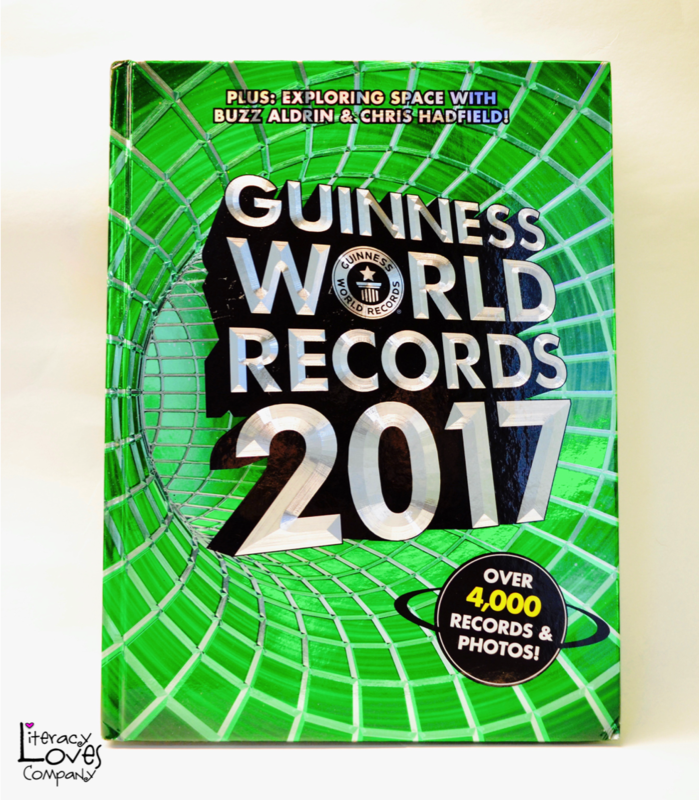 Don't forget to download your FREE Teachers Guide by clicking the link above and as a "Thank You" for visiting Literacy Loves Company and reading this blog post, the people at Guinness World Records have given me a copy of the NEW 2017 edition to give to one lucky reader! 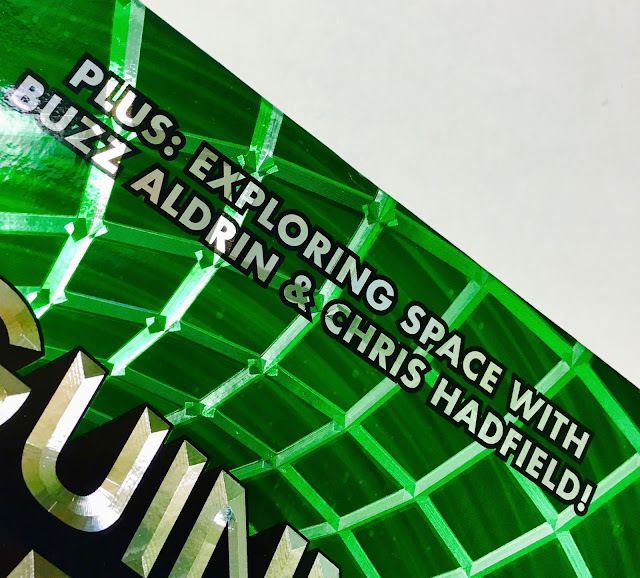 Since, if you win, I will have to ship the book to you, the giveaway is only open to people with mailing addresses within the continental United States. The giveaway is open from December 29, 2016 through January 9th, 2016. I only have one book, so there will only be one lucky winner! To enter, please enter your information in the Rafflecopter widget at the bottom of this post. The winner will be randomly chosen by the Rafflecopter widget. The winner will be announced Tuesday, January 10th on my Facebook page, Instagram account, here on the blog, and by email. The winner will need to respond to my email by January 15th with a mailing address so that I can get your book in the mail that next week. Thank you for visiting Literacy Loves Company! 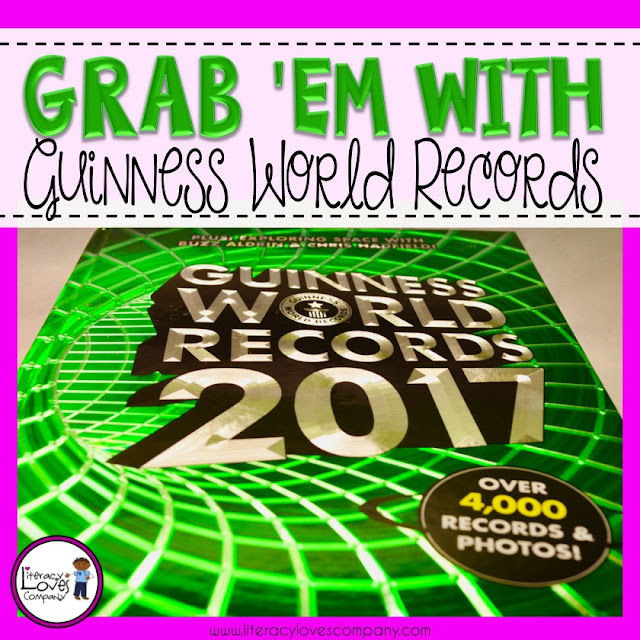 I hope this post has inspired you to take a closer look at your Guinness World Records books for inspiration! Well, next week I officially report back to work. It has been a great summer, but I am excited to get my classroom in order, turn all of those ideas I've been pinning and planning into reality, and finally meet my new bunch of fourth graders. I love back to school time! What I don't love about a new school year is being bombarded by germs... coughing, sneezing, dirty hands, nose picking, viruses, bacteria... OH MY! I can feel my throat start to scratch and my sinuses start to drain just thinking about it. In my school district, we teach about communicable and non-communicable diseases, pathogens, and heatlhy habits as part of our health curriculum. I always start the year with these valuable lessons that we refer to all year long. Because of a packed schedule, I only teach health once a week, so I need to make that lesson count! I've just finished the first three in a HUGE series of health lessons I plan on creating throughout the school year. 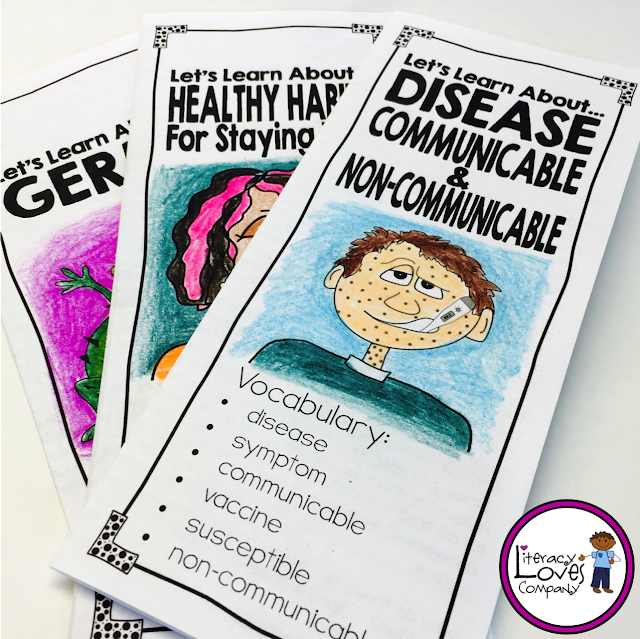 In lesson #1 students learn what communicable and non-communicable diseases are, examples of each and ways to protect against contagious illness. As a closing activity they play a "I have, who has" game as a class to review the vocabulary and concepts in the lesson. I'm FREE! Click to download! 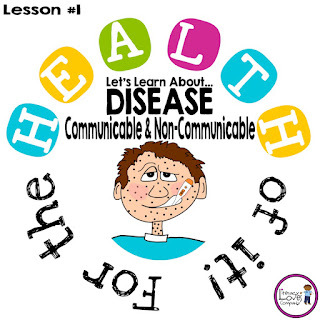 Lesson #2 goes into more depth about what causes communicable diseases, specifically viruses and bacteria. 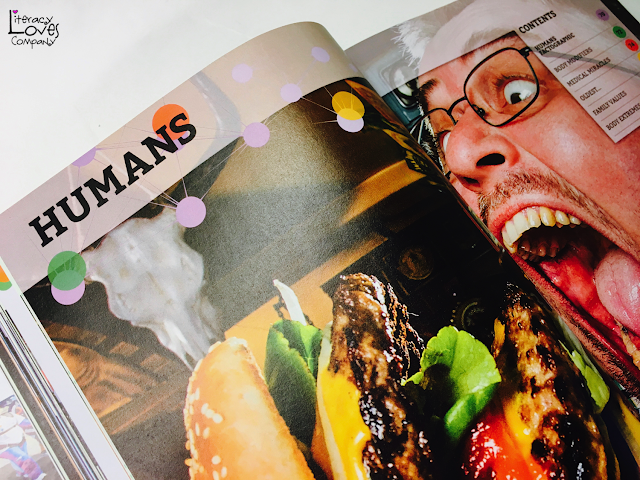 The informational brochure talks about the immune system and how it helps defend against these unwanted intruders. 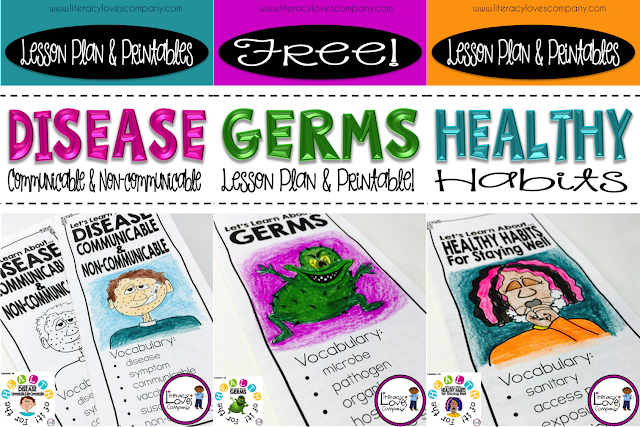 As part of the lesson, students design a germ and create a wanted poster sharing details from what they learned from their health brochure. 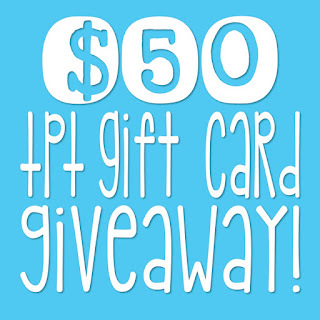 Click to go to TpT. 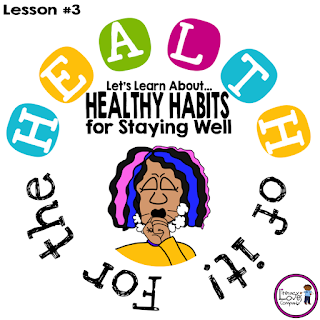 Lesson #3 teaches students about 8 healthy habits for staying well. This connect to both of the previous lessons, but goes into more details about how to keep well. 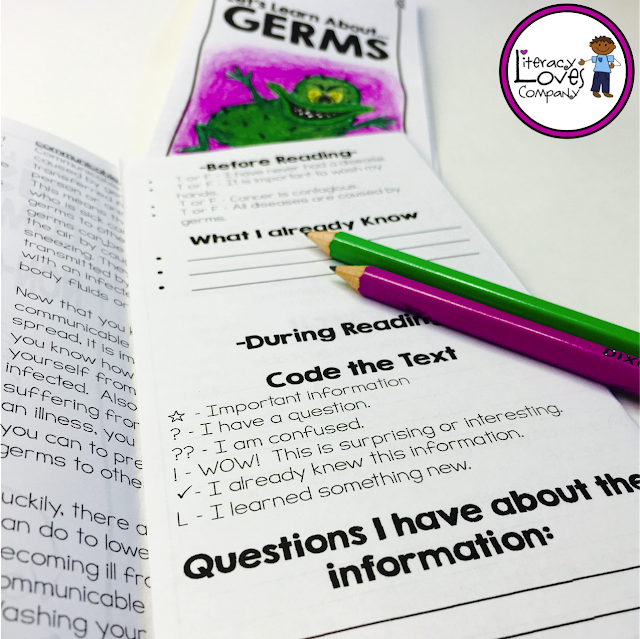 As an opening activity, students participate in an easy to science experiment to discover where the most germs are in the classroom. 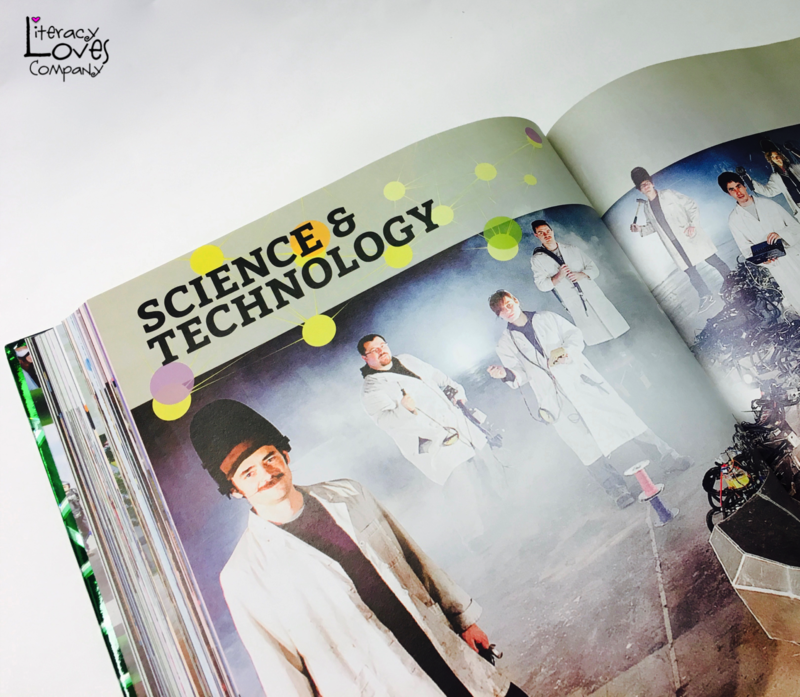 Each of these lessons includes detailed lesson plans, lesson objectives for posting, an opening activity, main lesson including a non-fiction text in brochure format, and a closing activity. 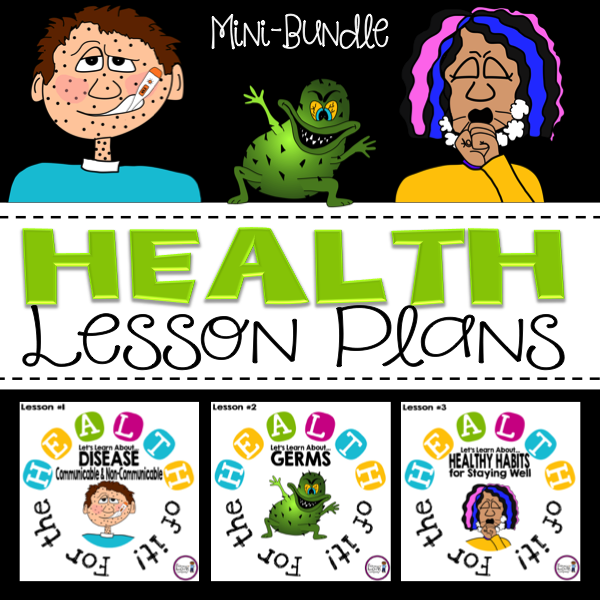 If you buy the MINI-BUNDLE of all three lessons, I've also included a grade book page with all of the objectives listed and an assessment covering all three lessons. If you already have a health curriculum, the health brochures are also a great way to revisit the concepts in a literacy center or as a take home assignment. 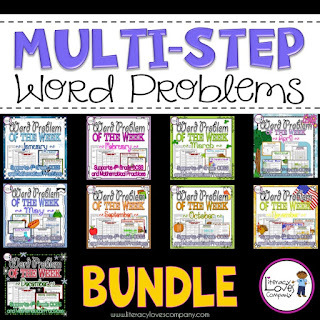 They include vocabulary, quick before reading activity, close reading/code the text key, and after reading vocabulary task and comprehension questions related to the lesson objectives. My next set of For the HEALTH of It! lessons will be focusing on HYGIENE! 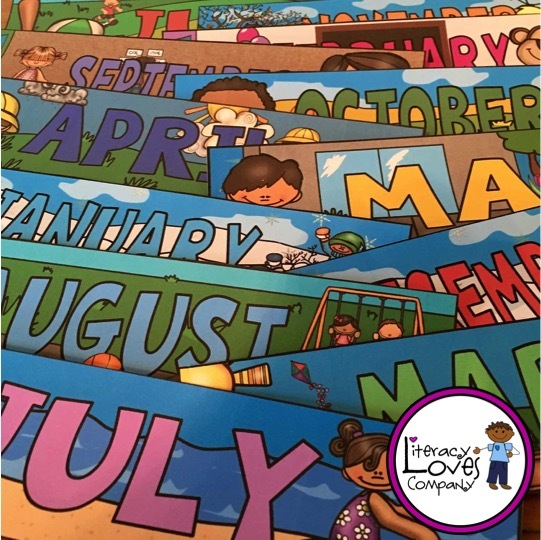 If you are interested in getting notification of when these lessons are completed, please follow Literacy Loves Company on TpT! All new resources are 50% off for the first 48 hours... that equals big savings. *NOTE... as I use these lessons in class, I'll update this blog post with photos of the lessons and activities. 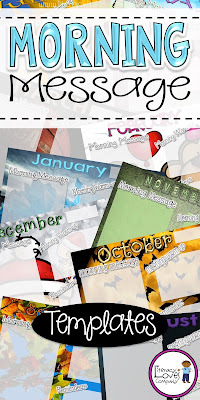 If you are interested, follow my blog by e-mail or on blog lovin! Thanks for visiting Literacy Loves Company Blog! 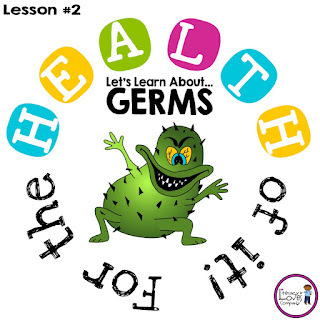 I hope you stay germ free and have a great Back to School season! No matter how long you have been teaching, whether this is your first year or you've been teaching for a dozen, one of the most important things you can do to support classroom management and help your school year go smoothly is to build a strong rapport with your students and a sense of community in your classroom. There are a hundred different things you can do to accomplish this such as holding class meetings, spending time on get-to-know-you activities the first week of school, and having clear expectations and consequences. Today I want to talk to you about another classroom routine that not only builds a sense of teamwork in your classroom, but also helps you, the teacher, keep your classroom organized and clean. 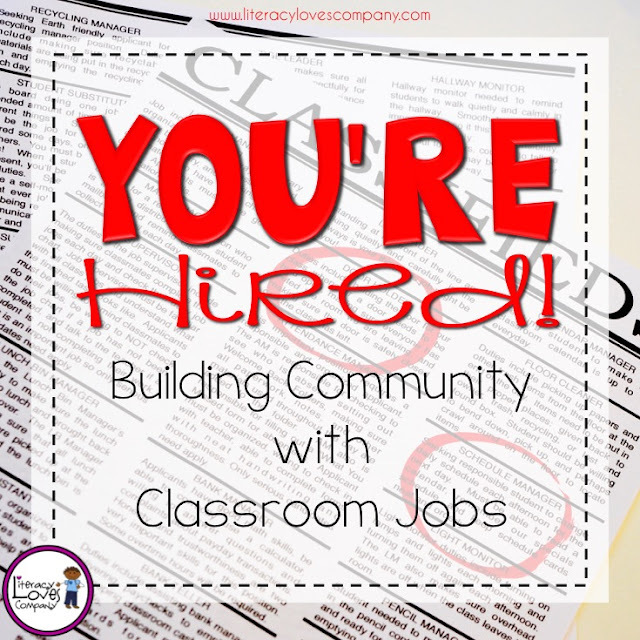 I'm talking about classroom jobs. Classroom jobs are a great way to help your students develop a sense of community and teamwork. 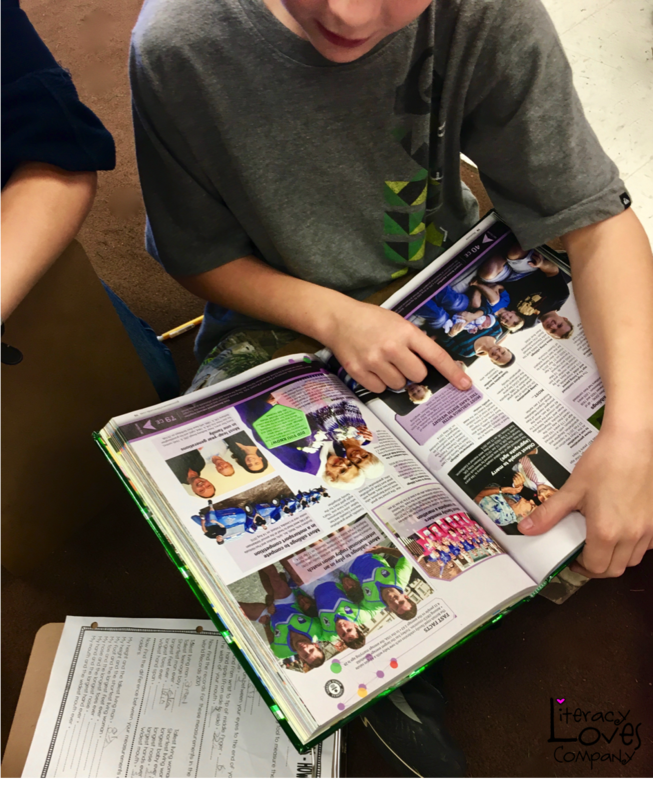 When all your students have one small task to complete each day, they begin to see that when everyone puts in that little bit of effort the class runs more smoothly, stays organized, is more conducive to learning, and is a more pleasant place to spend their day. As students complete their jobs and are recognized for their effort it builds self esteem and helps to establish a strong work ethic. 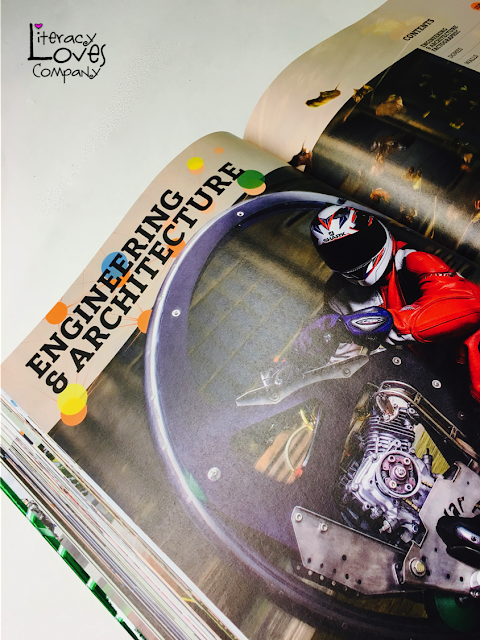 The key here is to make sure that every one of yours students has a classroom job that they are interested in, proud of, and are capable of completing successfully. Try to phrase your job titles in ways that make them sound interesting and important. For example, Recycling Manager sounds much more important that just recycler. Light Monitor more esteemed than light person. And Class Botanist more official than gardener. You want students to be proud of their positions and giving them powerful job titles is one way to do that. Giving students choices is important to building relationships and community. Rather than just assigning jobs to students randomly, it is a good idea to give students a chance to choose which jobs they would like to do. 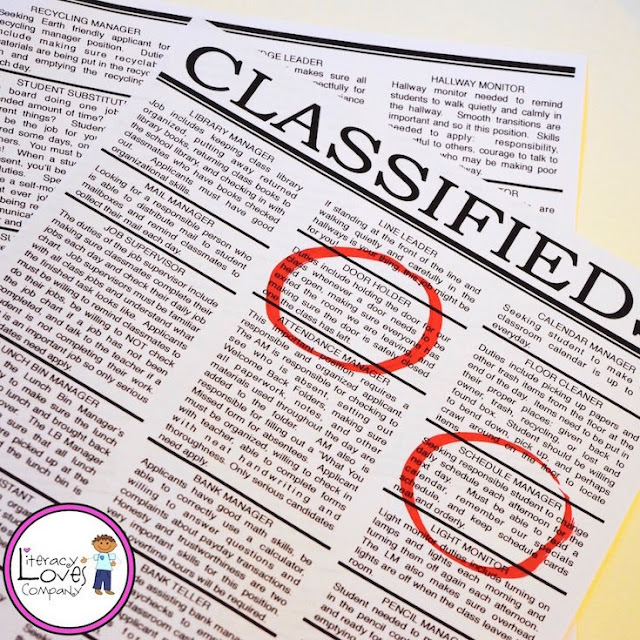 Classified ads are a great way to give your students some information about each of the jobs. 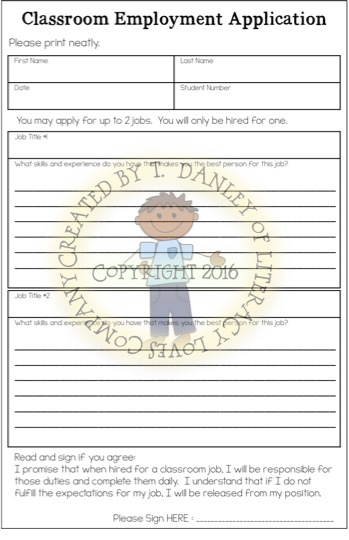 Each job has a short description so that students understand what will be expected of them if they get hired for that position. I plan on making several copies of these classified ads and give students time to read through them and circle jobs that are interesting to them. I also plan on keeping a clean copy on display near my job chart so that the descriptions are easily available for reference throughout the year. Undoubtably, there will be some jobs that everyone wants and a few that nobody is interested in. This is when having an Employment Application will come in handy. 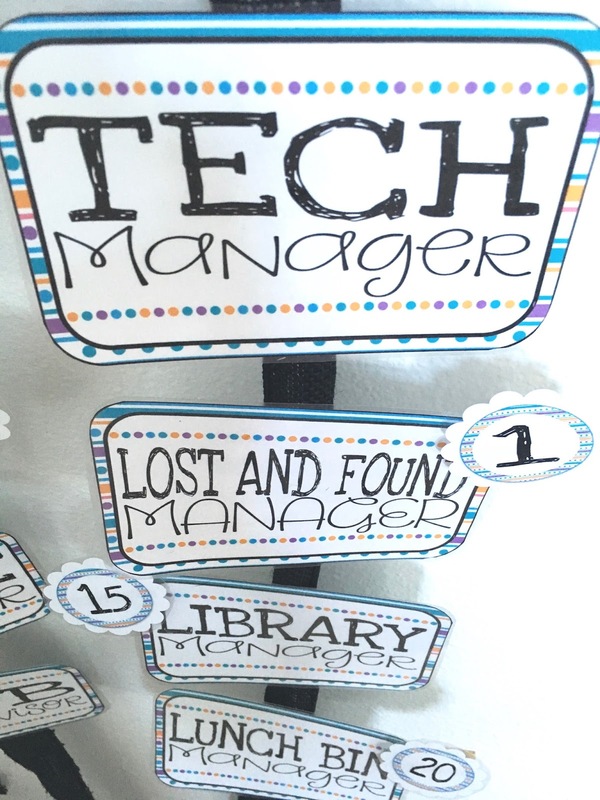 In the past, I've written all of the job titles on a large sheet of butcher paper and students wrote their names under the three job titles that they were interested in. I'd go through and choose a person for each job. This year, I want my students to give more thought into what skills they have that would make them the best person for the job that they want. I plan on asking each of my students to fill out the application with their top two choices. This will not only give me some information about my students while I am hiring, but it will also give my kiddos practice with the real world task of filling out forms. Hold students accountable for their jobs. In my class, I have two students who are my "Job Supervisors". These two students check off workers as they complete their jobs each day. This is important because we have a classroom economy and students get paychecks each month for their clean-up jobs. 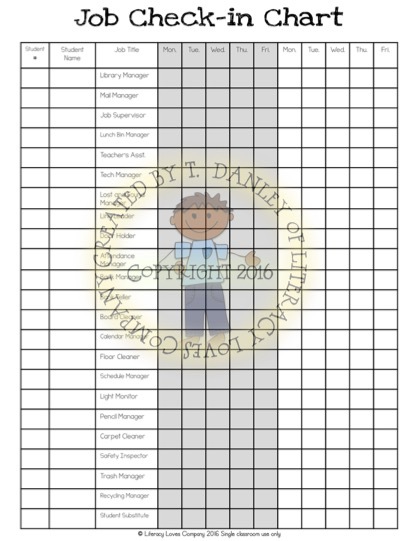 To help keep track of student positions and to help hold students accountable for their responsibilities, this chart is vital. I will be writing another blog post on our classroom economy, but for now I will say that I have found rewarding students for their hard work is an important part of this learning experience. As adults, we get paid for our work. I look forward to my paycheck and I enjoy spending my hard earned money. The same can be said for our students. They should be recognized for their efforts. You don't have to have a classroom economy. There are a lot of different ways you can show appreciation. 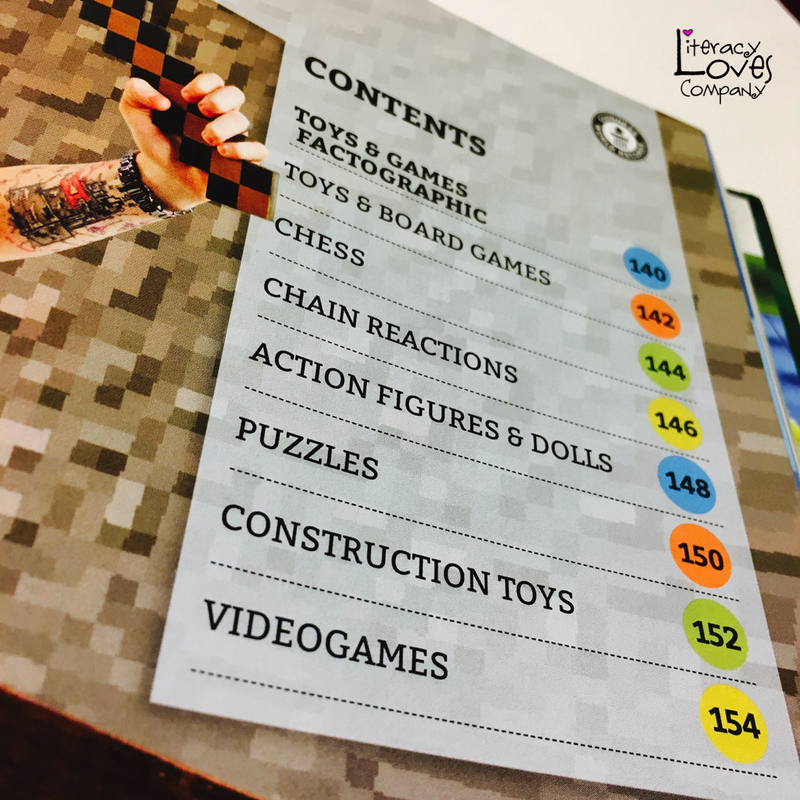 You can have lunch in the classroom, indoor recess, a board game party, and the list goes on. It is just important to let students know that their contribution to keeping the class clean and running smoothly is appreciated. 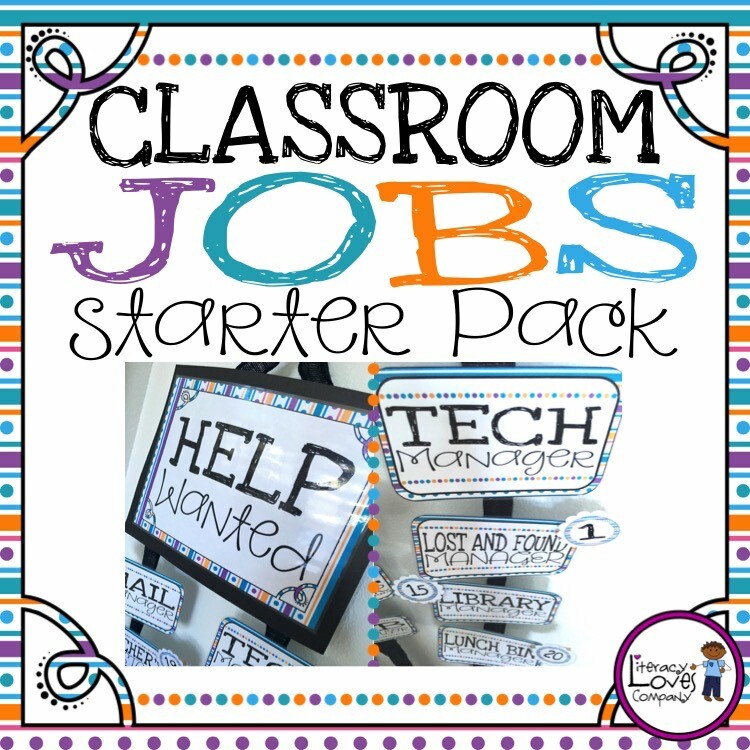 Classroom jobs may look differently depending on the grade level you teach, but no matter what age your students are, a small task for each student can be beneficial for all involved, including the teacher. I teach 4th grade and the help my students give me helps me keep my sanity! My students collect papers, deliver mail, change the daily schedule, make sure the calendar is up to date, sweep the floor, take out the trash, make sure absent students get missing work, make sure the lights are on and off... and the list goes on. All of these things I'd have to do myself if it wasn't for their help. And because every student is helping, our clean-up time is only about 5-10 minutes each day! If you aren't fully using the power of classroom jobs in with your students, I hope you will consider it. 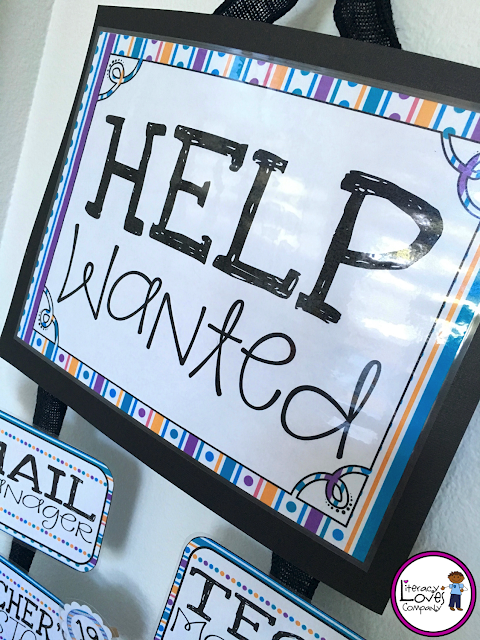 Like I mentioned above, it might look differently in your class than in mine, but hiring each of your students for one small task a day will not only keep your classroom clean and organized, but it will also have many positive benefits for your students. If you have more ideas, different suggestions, or questions about how I run classroom jobs with my students, please feel free to use the comment section below! I'd love to hear from you. 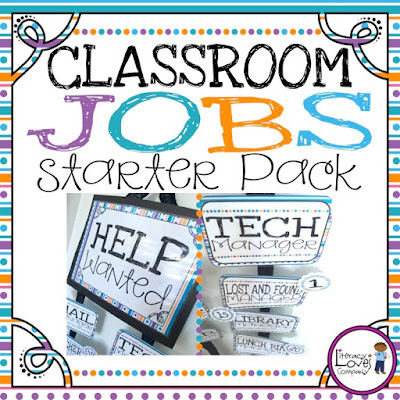 If you'd like to know more about my Classroom Jobs Starter Pack, click on the image below to open a new window to the product description on TeachersPayTeachers.com . Thank you so much for reading my post! 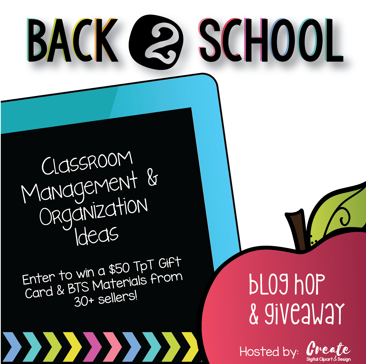 For more great Back-to-School management and organizational tips, hop on to the next blog post by Teacher Erica. 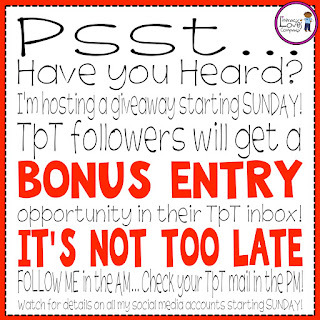 Don't forget to enter to win some great prizes! 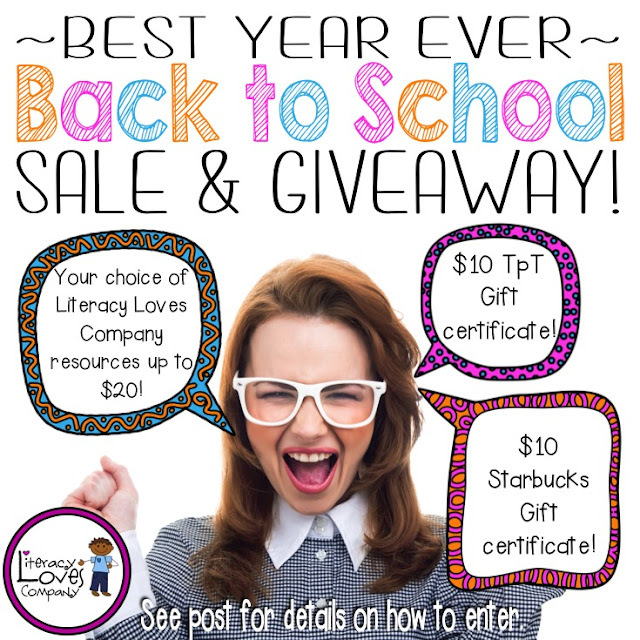 One lucky and deserving teacher will win a $50 gift certificate to TpT! 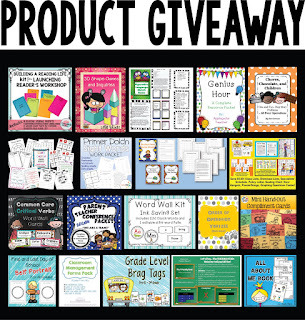 Another, equally deserving teacher will win TpT resources from 30, YES THIRTY, different sellers! 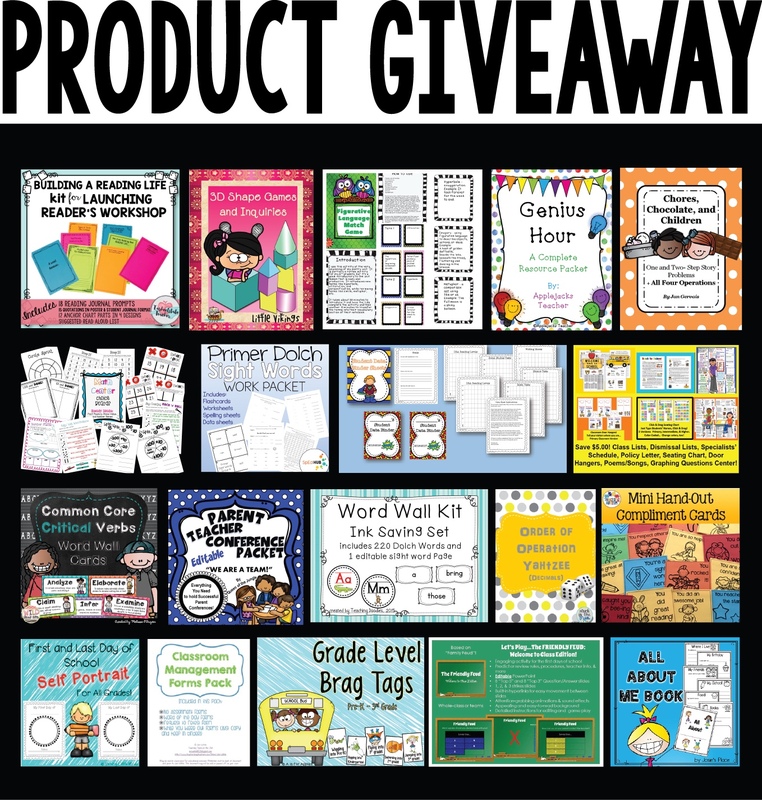 What a treasure trove of materials to get you started this school year! We don't really think about them much... kids bring their lunches in them, we put groceries in them, and sometimes they carry our last minute take-out meal. Paper bags. Paper bags have been around since the mid 1800s and, according to what I have read, haven't changed much in all these year. Why mess with a good thing, I guess. draw a self portrait and fill the bag with items about themselves. draw an animal in its habitat and fill with items related to the animal studied. do a book report by drawing a scene or a character on the bag and then fill it with items the character might have or need in the story. do a historical research project. 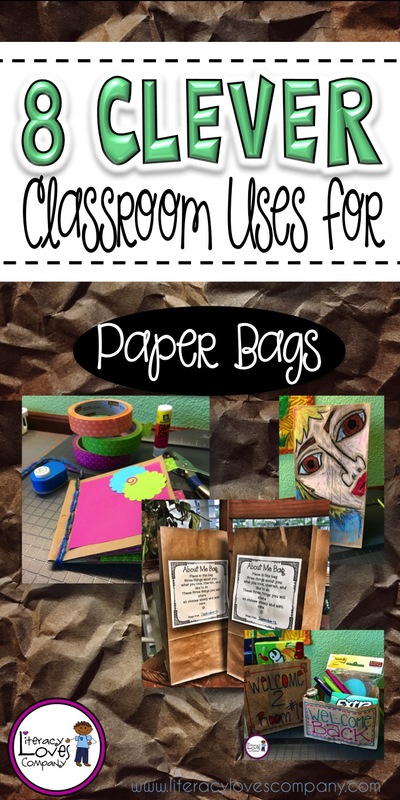 Students could draw a historical figures and fill the bag with "artifacts" related to the person or time period. I'm sure there are more ideas. If you think of any, please share them with us in the comment section. 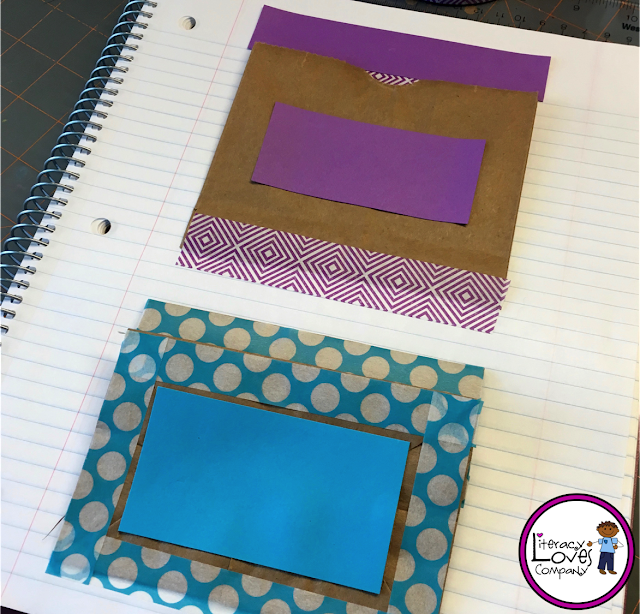 This project was inspired by a pin on Pinterest. You can find it HERE. 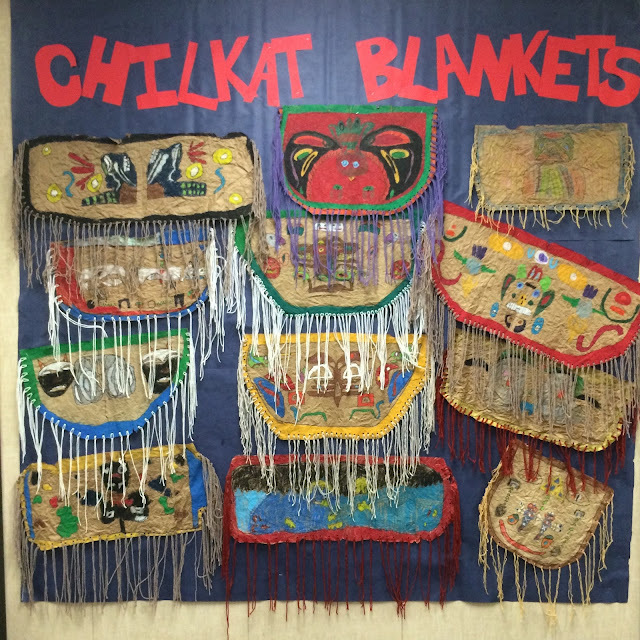 Another way that I integrate art into our study of Native Americans of the Northwest is to make Chilkat Blankets. In my class, I don't send student artwork home with students until Open House in the spring. Instead, I share pictures of the artwork on our class Facebook group and display the originals in the halls at school. 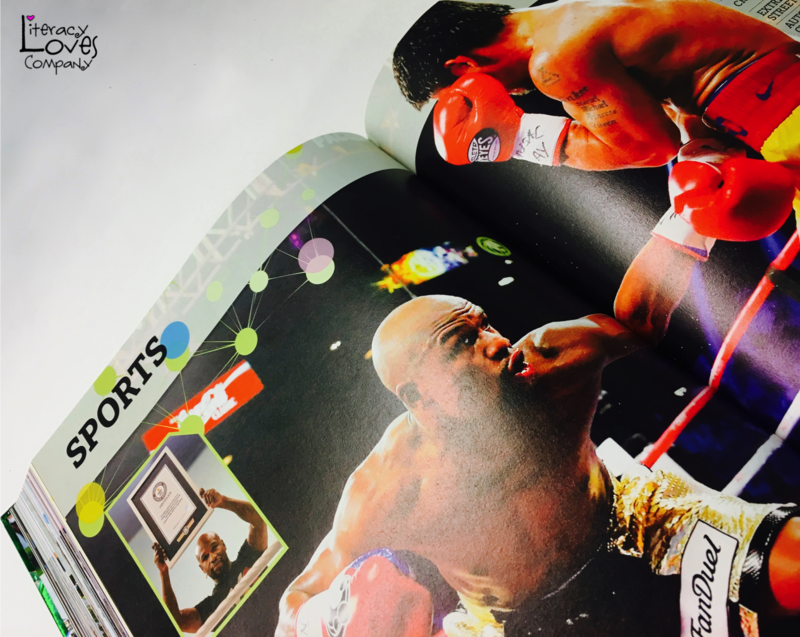 When the artwork is taken down, we put our artwork in the portfolios. Every year I purchase poster board for students to make art portfolios with. While looking for ideas for this post I came across a pin on Pinterest about making art portfolios. You can find the pin HERE. 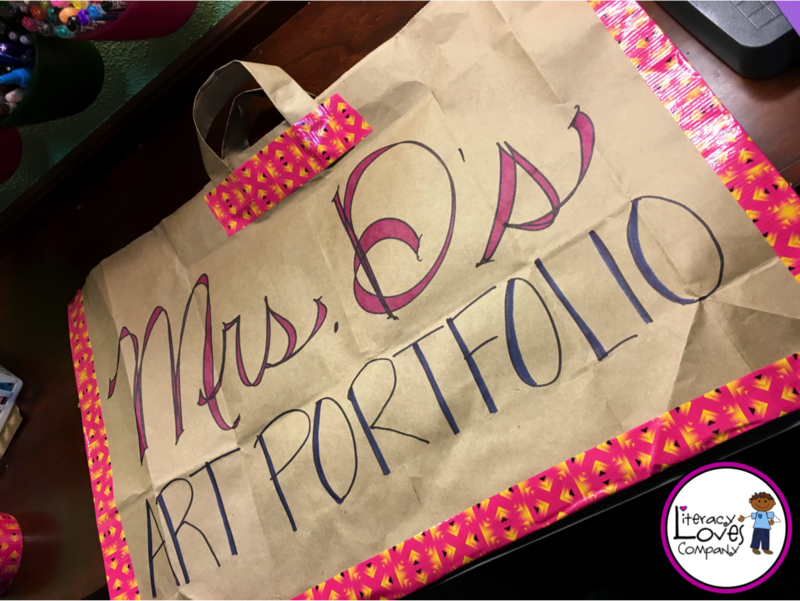 Using large grocery bags to make the portfolios is mind-blowing for me! First, I love to recycle and reuse as much as possible. This is a perfect example of that. 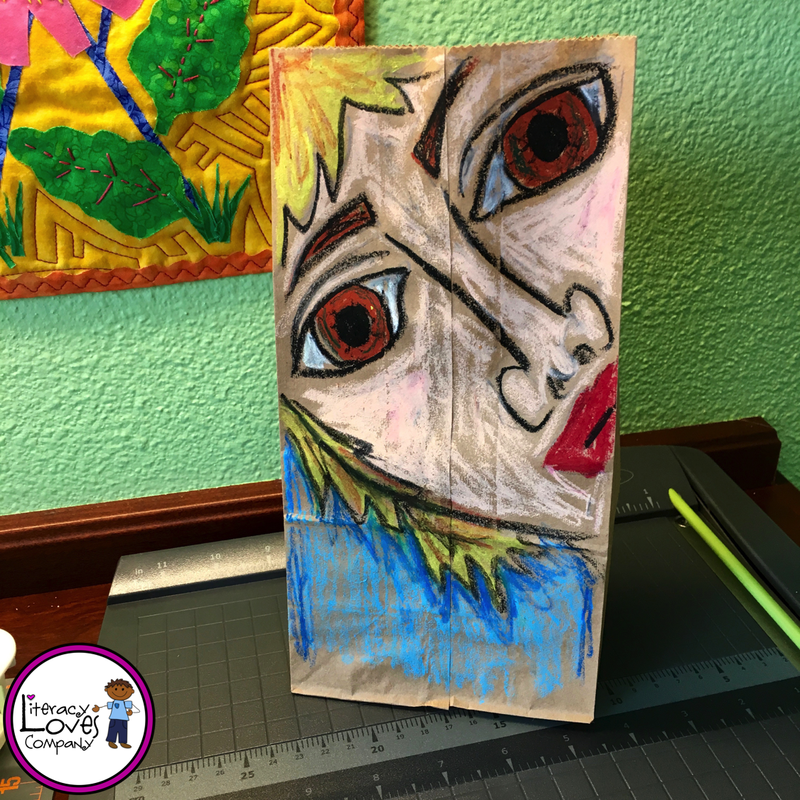 Second, paper bags are strong and with a little duct tape, you have a sturdy, attractive art portfolio for students to house their artwork all year long. As an added bonus, a lot of grocery bags have handles already built in (The ones I used in the picture didn't so I made my own.) which makes carrying the portfolios easy. 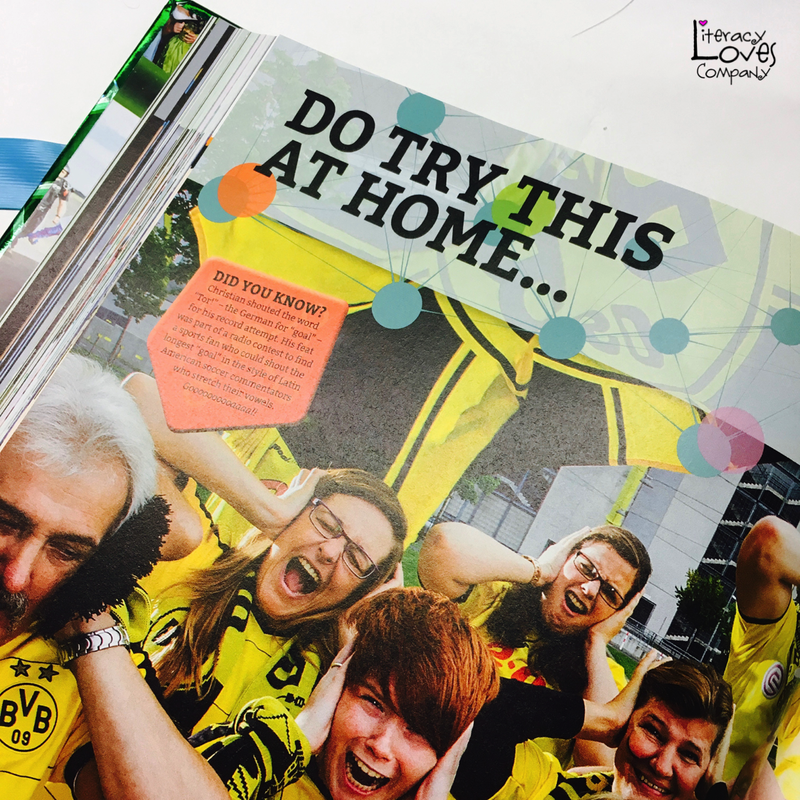 Interactive Notebooks are all the rage... and great teaching tools to boot! 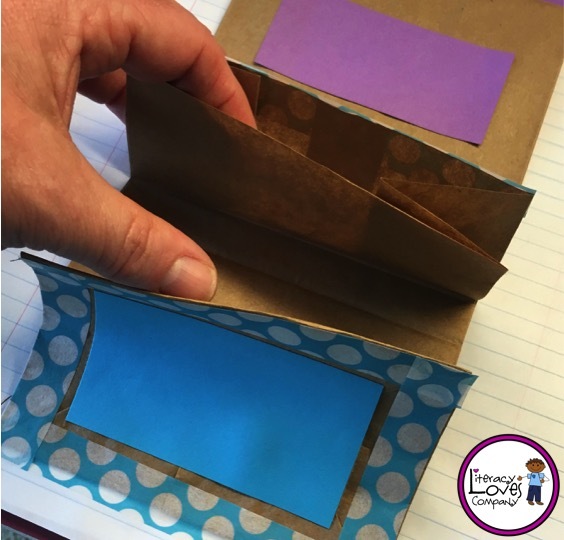 Use small lunch bags to create pockets for storing small items such as vocabulary cards, index cards, and other items that need to keep contained. One lunch bag can make two pockets. The pocket you see on the top opens up for easy access. 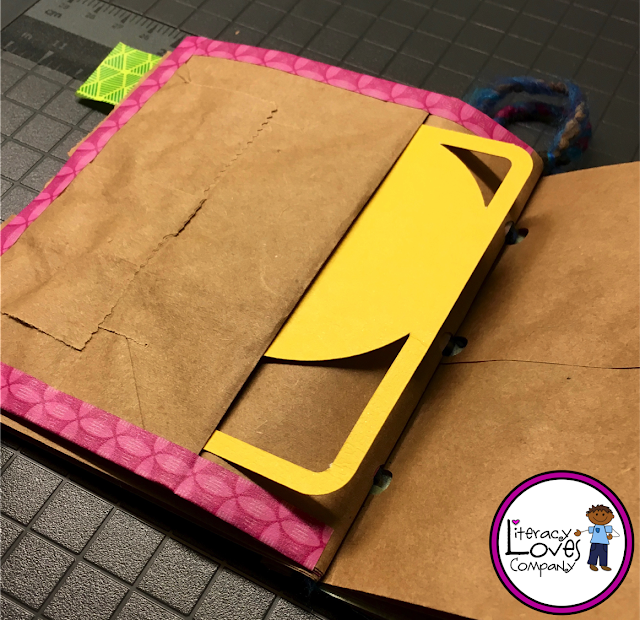 The second pocket, used with the bottom of the bag, folds behind the flap to keep items contained and more secure. 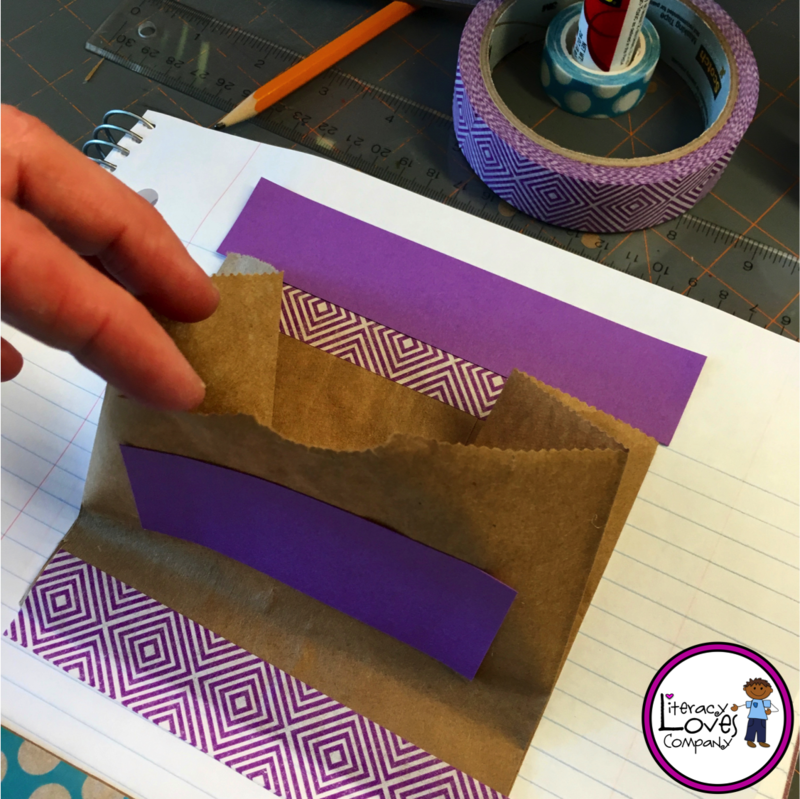 Paper bags make great little interactive books. 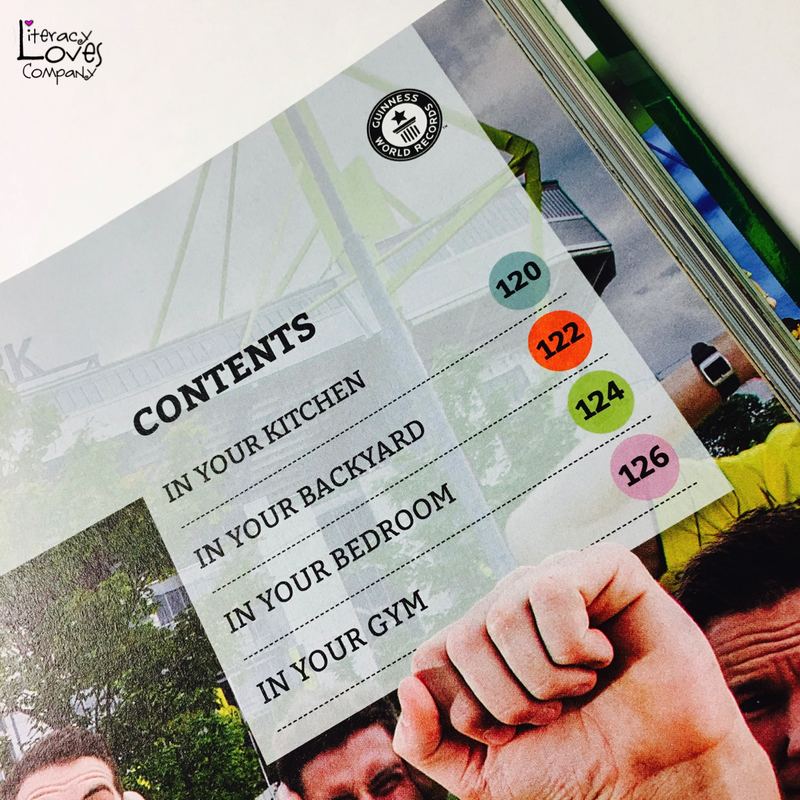 Because they have pockets, they can hold slide-out cards, photographs, and other memorabilia. I made this book using three lunch bags. There are a lot of clever things about this little book. The first is that it has larger pockets for photographs, cards, etc. to slide in and out. I made little tape tabs for my cards to make them easy to pull out. 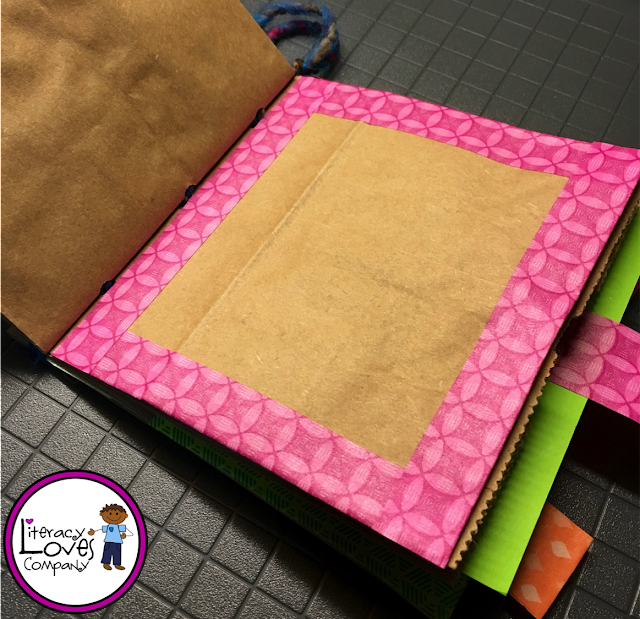 When using lunch bags, you get blank pages to write on or down items. The third things are these great little side pockets made with the ends of the bag. 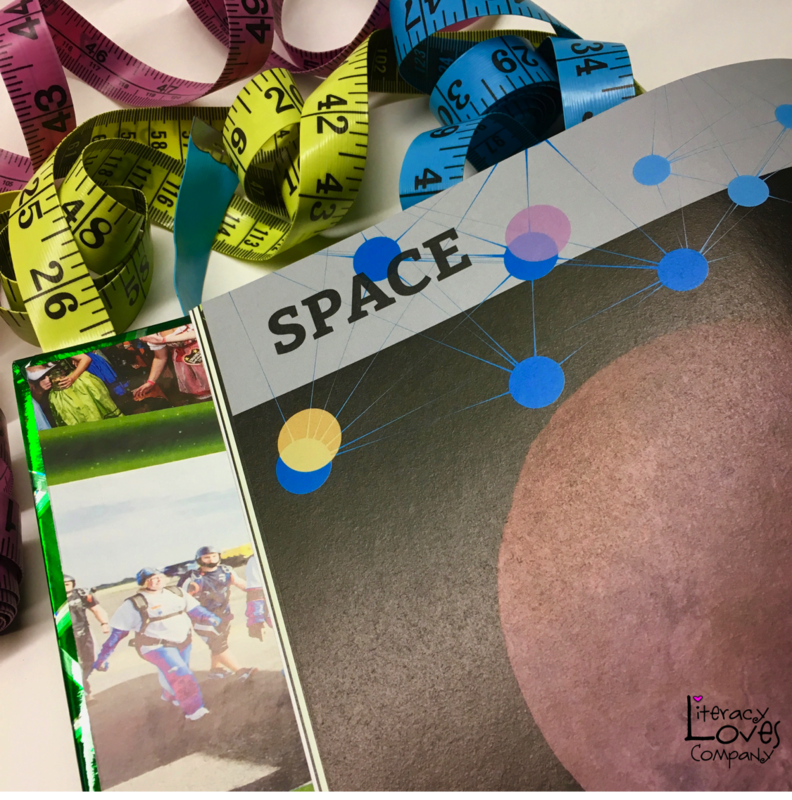 I love these little books and have been thinking about how they could be used in the classroom. My first thought is as poetry books. there is a lot of space to house poems and creatively illustrate student writing. Another great use for paper bags is to use them for journal covers. 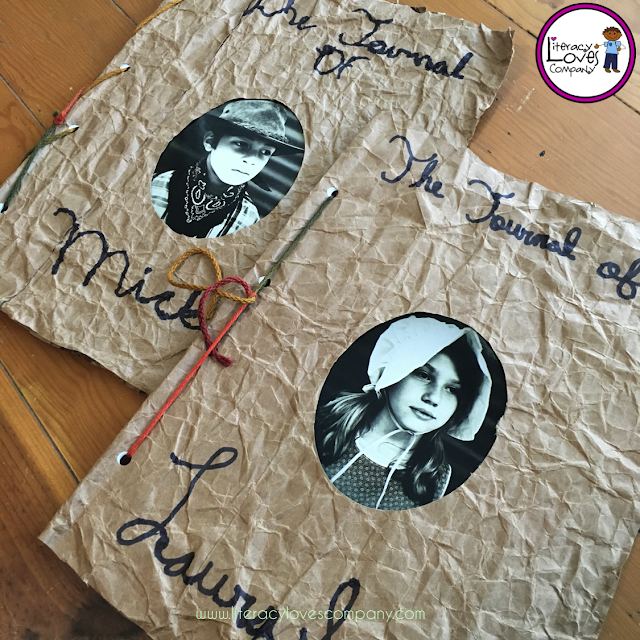 I wrote a whole blog post on how to make these pioneer journals. You can read it HERE. Everyone loves getting goodie bags, students and teachers alike! Paper bags make cute little holders for any holiday or event. 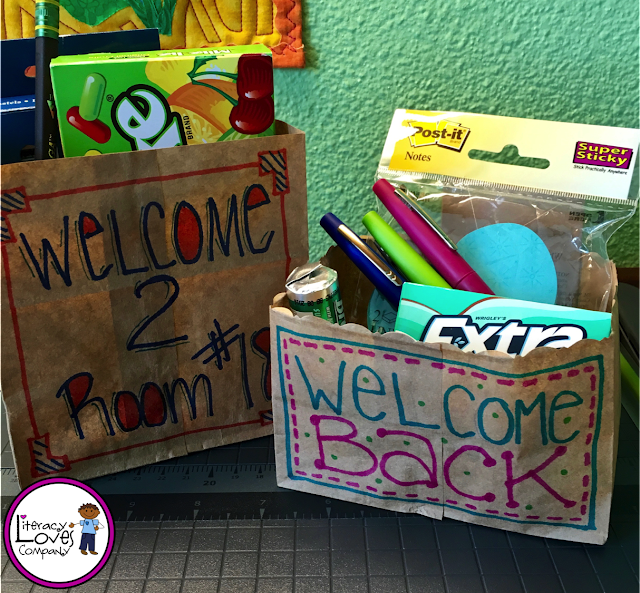 For back-to-school consider making little packages for your students to welcome them your class. 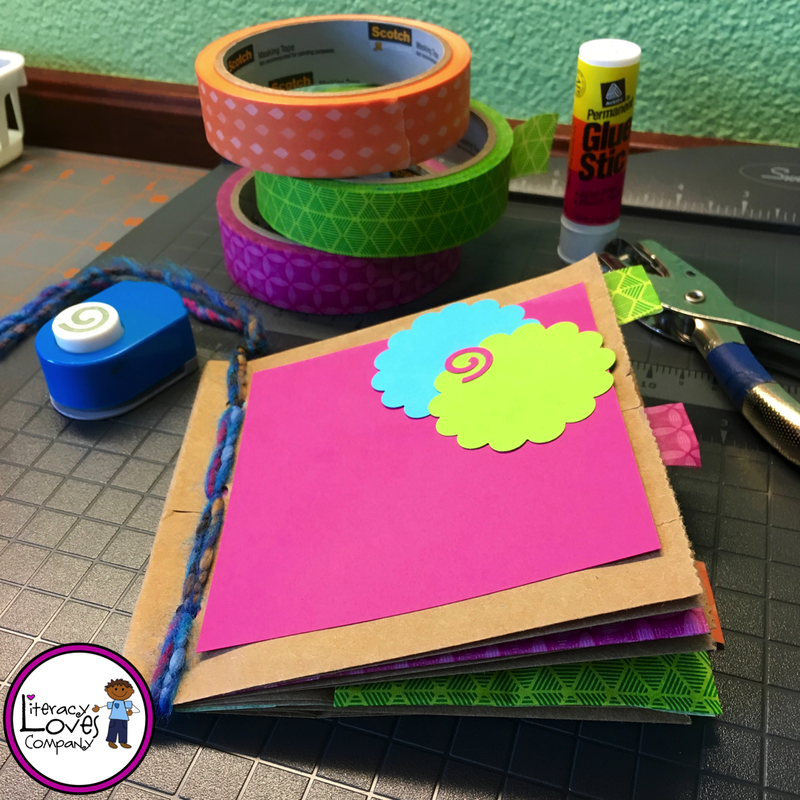 Another great idea is to make packages for your colleagues with items teachers love. Kids of all ages LOVE puppets! Paper bag puppets are a great way to engage your students and get them thinking creatively. Even with older students, puppets are a meaningful way to apply learning and show understanding of concepts. 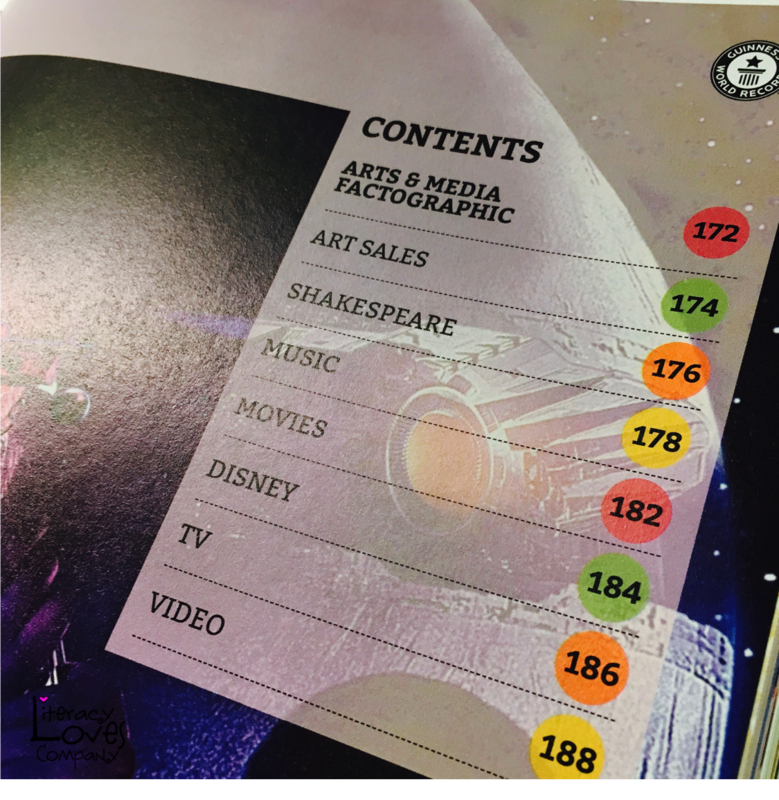 Just like some ideas mentioned above, puppets can be used for traditional reports on historical figures, book characters, and animals reports. But take a moment to ask your students to think a bit more abstractly. What would a puppet of the cell look like? What would it say? How about a stomach, a germ, or even a volcano? Think about the concepts you are teaching and challenge your students to come up with puppets and scripts to present what they have learned to the class. This would be a wonderful alternative to the traditional exam or report! I'm awful at remembering birthdays. Even my own family's. One year I totally forgot my husband's birthday, which is in September... bad timing with back-to-school and all! Eventually he forgave me, but because I am so bad with dates, I have to do everything I can to help myself remember these special occasions. In the classroom I've helped myself by displaying students' birthday goody bags by month on one of the classroom walls. It doesn't take up much room and saves me a ton of time. 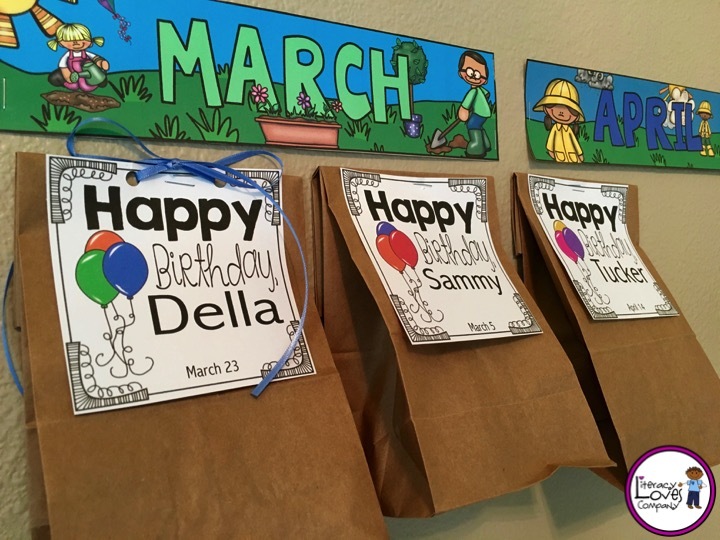 Checking the birthday display now and then I get a quick peek at the birthdays for the month and have a birthday bag all prepared for each student. 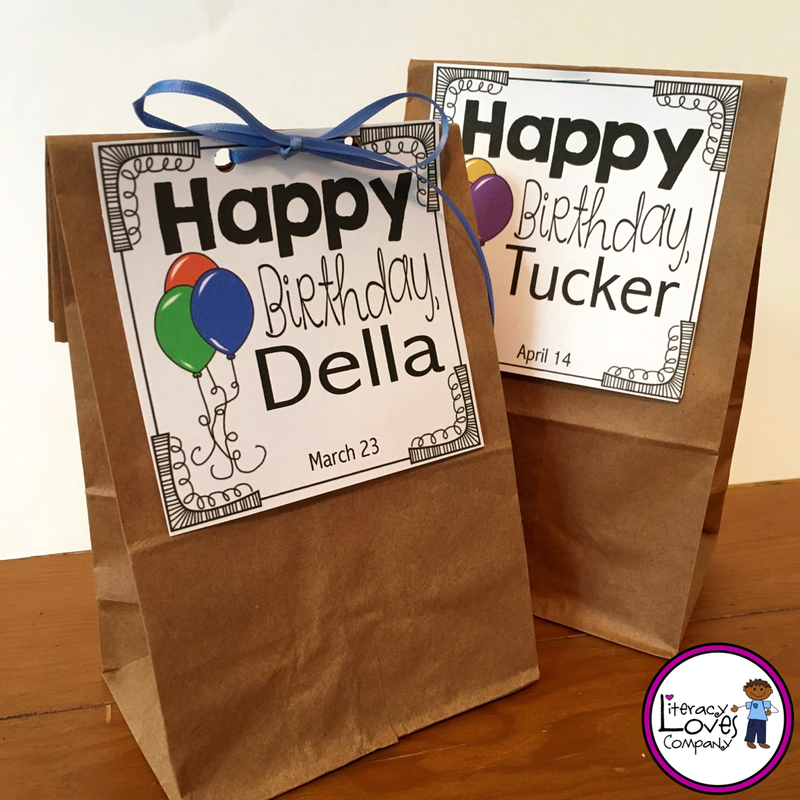 No more scrambling to find those "Happy Birthday" pencils and stickers... they are already packaged and ready to go! Paper bags are an easy answer for this display. The personalized bag tags dress them up and they hang nicely when stapled to the wall. 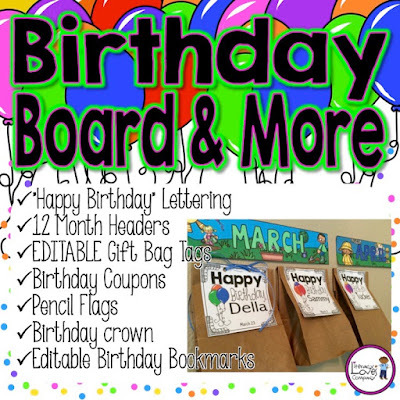 This summer I've worked on designing a brand new Birthday Display pack I'll be using in my own classroom. I'm very excited to get it up on my wall this fall! 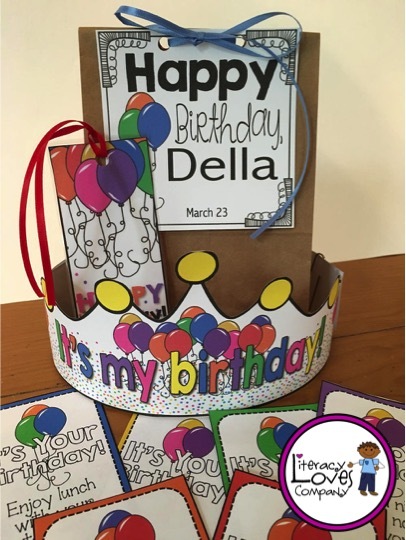 It includes editable bag tags and birthday book marks, 6 different birthday coupons, pencil flags, month headers, birthday crown, and "Happy Birthday" bulletin board letters. This will make my year so much easier! 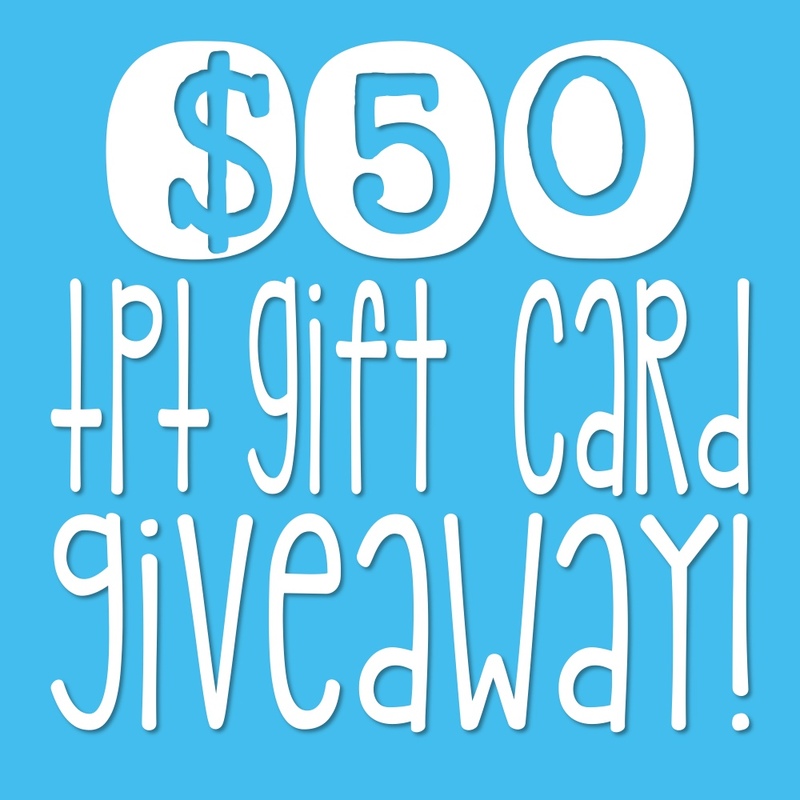 It's a brand new upload to my TpT store, so I'm selling it for 50% off through July! Click on the product cover to take a look at it. And now, because you stuck around through all 7 of the ideas above... Here is #8 and a FREEBIE for Back to School! 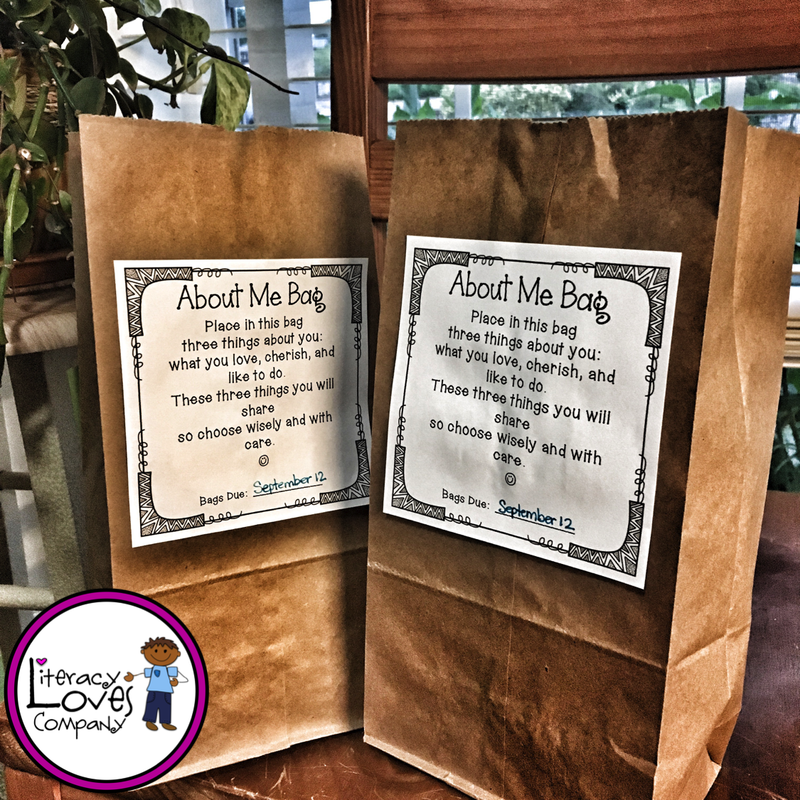 About Me Bags are a great way to get to know your students at the beginning of the school year. 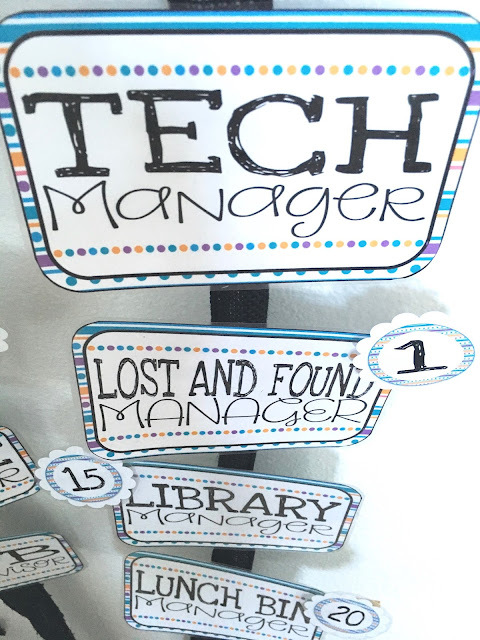 Glue these tags to the front of your brown paper bags and hand out the first week of school. Don't forget to fill your own bags so students learn a little bit about you. This is also a great opportunity to model for your class how to present their bags to the class. As an added extension, use the bags as a writing prompt to learn about how to write a great paragraph or a longer 5 paragraph essay! Click HERE to get your free download of About Me Bags Tags! So there you have it! 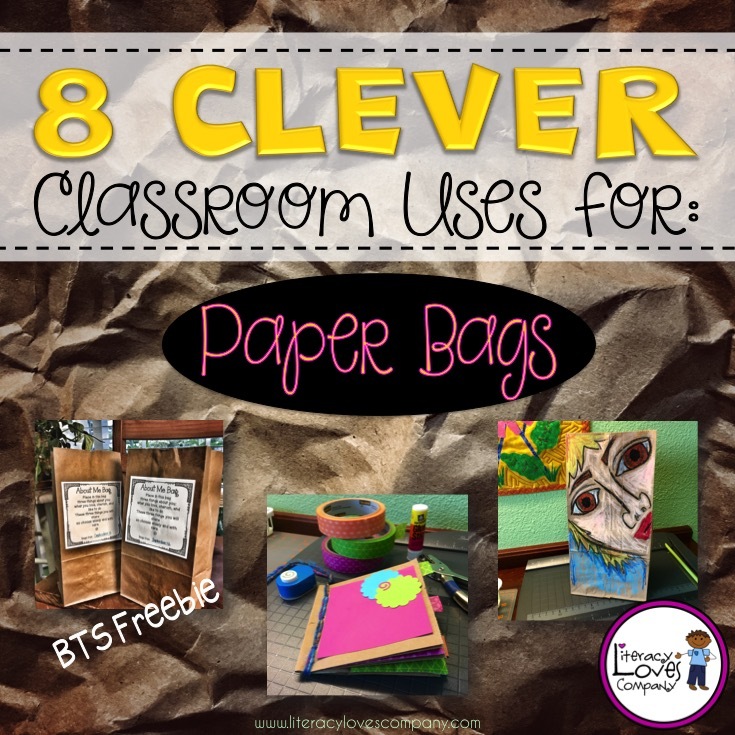 8 Creative and clever uses for using paper bags in the classroom! I hope that this post has inspired you to try at least one of these ideas this coming school year! 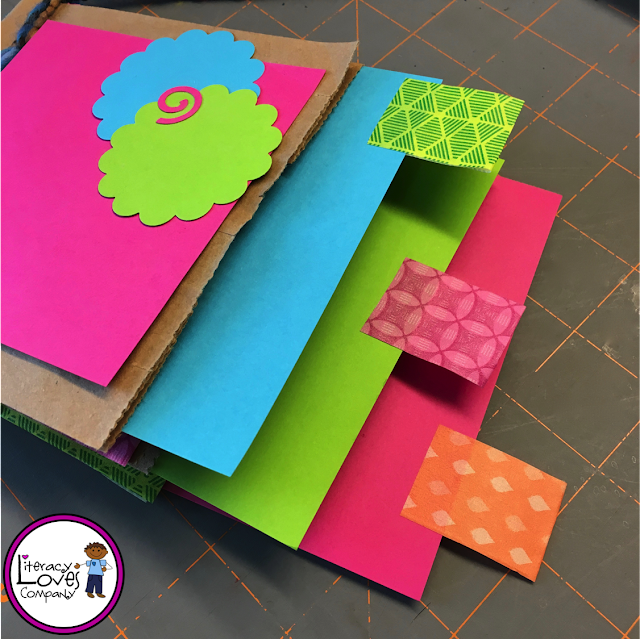 I know that I've inspired myself and I can't wait to see what other great ideas you all have for using this everyday item in new and interesting ways! Thanks for visiting and I hope you all have a GREAT Back to school!